2003-05-08 Application filed by 노쓰웨스트 바이오써라퓨틱스, 인크. filed Critical 노쓰웨스트 바이오써라퓨틱스, 인크. 본 발명은 수지상 세포와 같은, 항원제시 세포 제제의 성질을 평가하기 위한 방법을 제공한다. The present invention provides a method for evaluating the properties of the cell preparation presenting the antigen, such as dendritic cells. T 세포의 항원-독립적 공동자극 및 APC에 의한 예정된 항원의 제시에 대한 검정을 제공한다. T-cell antigen-service tests for the presentation of a predetermined antigen by an independent co-stimulation, and APC. 항원-제시 세포(APC)는 효과적인 면역 반응을 유도하는 데 중요하다. Antigen-presenting cells (APC) are important for inducing an effective immune response. APC는 항원-특이적 T 세포 수용체를 가진 T 세포에 항원을 제시할 뿐 아니라, T 세포 활성화에 필요한 시그날을 제공한다. APC is antigen-as well as to present the antigen to T cells with specific T cell receptor, and provides a signal required to activate T cells. 이들 시그날은 각종 세포 표면 분자 및 사이토킨 및/또는 성장 인자의 생산과 관련이 있다. These signals are associated with various cell surface molecules and cytokines and / or production of growth factors. 비접촉(naive) 또는 초회 항원자극되지 않은(unprimed) T 세포의 활성화에 필요한 시그날들은 이미 초회 항원자극된 면역기억(memory) T 세포의 재-활성화에 요구된 것들과 상이할 수 있다. Contactless (naive) or a signal required for the initial activation of the antigen that are not stimulated (unprimed) T cells already in the initial material antigen-stimulated immune memory (memory) T cells may be different from those required for activation. APC는 단핵구, B 세포 및 수지상 세포를 포함한다. APC includes monocytes, B cells and dendritic cells. 비록 단핵구 및 B 세포의 항원 제시 능력이 이미 감작화된 T 세포의 재-활성화에 제한되는 것으로 나타났지만, 이들은 수용적격(competent) APC인 것으로 보인다. Although the antigen-presenting capacity of monocytes and B cells already closed re-drawing of the T cell-natjiman appear to be limited to the activation, which appears to be a receiving eligibility (competent) APC. 이들 세포 유형은 기능상 비접촉성이거나 초회 항원자극되지 않은 T 세포 집단을 직접 활성화할 수 없다. These cell types are not directly activate the T cell population is not functionally stimulating antigen Initial or non-contact. 다른 측면에서, 수지상 세포는, 비접촉 및 이미 초회 항원자극된 T 세포 둘다를 활성화할 수 있다. In another aspect, dendritic cells can be activated and a non-contact already initial antigen-stimulated T cells both. 수지상 세포는 특징적 형태, 및 혈액을 포함하여, 광범위한 조직 분포를 갖는 이질성 세포 집단이다. Dendritic cells including the characteristic form, and blood, is a heterogeneous population of cells with a wide range of tissue distribution. (예를 들면, [문헌: Steinman, Ann. Rev. Immunol. 9:271-96(1991)]을 참조한다.) 수지상 세포의 세포 표면은 특징적 막-유사 돌기를 갖는 독특한 형태이다. A unique shape with a similar projection ([. 271-96 (1991) Document:: Steinman, Ann Rev. Immunol 9] See, for example,) the cell surface of dendritic cells is characterized by a film. 성숙한 수지상 세포는 일반적으로 CD11c + HLA-DR + , CD86 + , CD54 + , CD3 - , CD19 - , CD14 - , CD11c + 및 HLA-DR + 로 동정된다. Mature dendritic cells are generally CD11c + HLA-DR +, CD86 +, CD54 +, CD3 - is identified as, CD11c +, and HLA-DR + -, CD19 - , CD14. 수지상 세포는 항원을 수용, 처리 및 제시하며, 비접촉성 초회 항원자극되지 않은 T-세포 및 면역기억 T 세포로부터 반응을 자극한다. Dendritic cells, and receiving the antigen processing and presentation, it stimulates the response from the non-contact initial antigen non-stimulated T- cells and immune memory T cells. 이들은 MHC-제한 T 세포를 감작화시키는 높은 능력을 가지며 T 세포에 항원을 제시하는 데 매우 효과적이다. These are highly effective in having a high capacity for sensitizing crystallized MHC- restricted T cell presents the antigen to T cells. 수지상 세포는 자가-항원(예를 들면, T 세포 발달 및 내성 중) 및 외래 항원(예를 들면, 면역 반응 중) 둘 다를 제시할 수 있다. Dendritic cell is a self-antigen can be presented (e.g., T-cell development and tolerance of) foreign antigens and both (e.g., of the immune response). 추가로, 수지상 세포는 또한 비-림프 조직과 직접적으로 소통하며 상해 시그날(예를 들면, 허혈, 감염 또는 염증) 또는 종양 성장에 대해 비림프 조직을 조사한다. In addition, the dendritic cells are also non-direct traffic in the lymphoid tissues, and is irradiated with non-lymph tissue for injury signal (e.g., ischemia, infection, or inflammation) or tumor growth. 일단 시그날이 전달되면, 수지상 세포는 림프구 및 단핵구의 활성을 자극하는 사이토카인을 방출함으로써 면역 반응을 개시한다. Once the signal is transmitted, dendritic cells initiate an immune response by releasing cytokines that stimulate activity of lymphocytes and monocytes. 항원 제시에서 이들의 효능에 기인하여, 면역자극제(생체내 및 생체외 둘 다)로서 수지상 세포를 사용하는 데 관심이 고조되고 있다. Due to their effectiveness at antigen presentation, immunostimulants (both in vivo and in others), there is interest in using dendritic cells as an escalating. 특히, 성숙한 수지상 세포는 표적 항원에 대해 제조될 수 있으며 이어서 피검체(예를 들면, 환자)에 투여되어 당해 항원에 대한 면역 반응을 자극할 수 있다. In particular, the mature dendritic cells can be prepared for the target antigen, and then the subject can stimulate an immune response in the art is administered (e. G., Patient) antigens. 예를 들면, 비성숙 수지상 세포는 표적 항원(들) 및 성숙화제(들)과 접촉하여 표적 항원에 특이적으로 활성화되고 성숙한 수지상 세포가 될 수 있다. For example, non-mature dendritic cells can be the target antigen (s) and maturation agents (s) and in contact with and activated specifically to the target antigen of mature dendritic cells. 추가로, 세포 집단내의 성숙한, 항원-특이적 수지상 세포는 표적 항원에 특이적인 수지상 세포의 수를 증가시키기 위해 증폭될 수 있다. Additionally, the mature cells in the group, the antigen-specific dendritic cells may be amplified to increase the number of dendritic cells specific for the target antigen. 수지상 세포 및 수지상 세포 전구체를 각종 방법으로 분리할 수 있다. Dendritic cells and dendritic cell precursors can be isolated by various methods. 이들 세포 유형은 통상 낮은 빈도로 존재한다(예를 들면, 통상 백혈구의 약 1% 미만). These cell types are present in the normal low frequency (e.g., less than about 1% of normal white blood cells). 따라서, 수지상 세포 및 수지상 세포 전구체를 분리시키는 방법은 충분한 수의 세포를 제공하기 위해, 통상 실질적 정제만을 필요로 하거나, 생체외 배양을 함께 필요로 한다. Thus, the method of removing the dendritic cells and dendritic cell precursors is to provide a sufficient number of cells, usually only require a substantially purified or require with an in vitro culture. 수지상 세포 및 이들의 전구체를 정제하는 방법은 예를 들면, 밀도 구배 분리, 형광 활성화 세포 분류, 패닝(panning)과 같은 면역학적 세포 분리 기법, 보체 용해, 로젯팅(rosetting), 자기 세포 분리 기법, 나일론 모직 분리 및 이러한 방법의 조합을 포함한다. Method for purifying dendritic cells and their precursors, for example, density gradient separation, fluorescence activated cell sorting, panning, separation immunological cells, such as (panning) techniques, complement dissolved, jetting (rosetting), separating the magnetic cells with techniques, It includes nylon wool separation, and combinations of these methods. (예를 들면, [문헌: O'Doherty et al., J.Exp.Med. 178:1067-76(1993); Young and Steinman, J.Exp.Med.171:1315-32(1990); Freudenthal and Steinman, Proc. Natl. Acad. Sci. USA 87:7698-702(1990); Macatonia et al., Immunol. 67:285-89(1989); Markowicz and Engleman, J.Clin. Invest. 85:955-61(1990); Bernllard et al., Cancer Res. 55:1099-104(1995); Caux et al., Nature 360:258-61(1992); 미국 특허 제5,994,126호 및 제5,851,756호를 참조한다.) (E. G., [Reference: O'Doherty et al, J.Exp.Med 178: 1067-76 (1993); Young and Steinman, J.Exp.Med.171:.. 1315-32 (1990); Freudenthal .... and Steinman, Proc Natl Acad Sci USA 87: 7698-702 (1990); Macatonia et al, Immunol 67:.... 285-89 (1989); Markowicz and Engleman, J.Clin Invest 85: 955 -61 (1990); Bernllard et al, Cancer Res 55: 1099-104 (1995); Caux et al, Nature 360:... 258-61 (1992); see U.S. Patent Nos. 5,994,126 and No. 5,851,756 No. ). 수지상 세포를 제조하는 데 사용될 수 있는 각종 방법에 기인하여, 수지상 세포 제제의 특성은 매우 다양할 수 있다. Due to the variety of methods that can be used to prepare the dendritic cells, the nature of the dendritic cell preparation can be widely varied. 예를 들면, 수지상 세포는 항원에 대해 반응하는 비접촉 T 세포를 활성화시키기 위한 이들의 능력이 다양할 수 있다. For example, dendritic cells may have their ability to activate the non-contact T cells that respond to antigen may vary. T 세포의 활성화는 2가지 시그날을 필요로 한다. Activation of T cells requires two signals. 제1 시그날은 T 세포 수용체(TCR)을 통해 전달되며 T 세포의 항원 특이성을 정의한다("항원-특이적" 시그날). The first signal conveys a defined antigen specificity of the T cell via the T cell receptor (TCR) ( "antigen-specific" signal). 제2 시그날 또는 공동 자극 시그날은 T 세포 및 수지상 세포상의 다중 수용체/리간드 쌍(공동 자극 쌍)에 의해 전달될 수 있다. A second signal or co-stimulating signals can be delivered by multiple receptor / ligand pair on T cells and dendritic cells (co pole pairs). T 세포 및 수지상 세포 각각에서 발현되는 이들 공동 자극 쌍은 CD28/CD152(CTLA-4) 및 CD80/CD86; These co pole pairs expressed on T cells and dendritic cells respectively CD28 / CD152 (CTLA-4) and CD80 / CD86; 4-1BB 및 4-1BBL; 4-1BB and 4-1BBL; CD27 및 CD70; CD27 and CD70; LFA-1 및 CD54를 포함한다. And a LFA-1 and CD54. 수지상 세포의 제제는 T 세포에 항원을 제시하는 이들의 능력이 다양할 수 있다. Preparation of dendritic cells may be, their ability to present the antigen to T cells of various. 예를 들면, 제제는 표적 항원을 제시하는 소수의 수지상 세포를 함유할 수 있다. For example, the formulation may contain a small number of dendritic cells that present the target antigen. 추가로, 수지상 세포의 제제는 T 세포에 대해 오직 소량의 표적 항원만을 제시할 수 있다. In addition, the preparation of dendritic cells may present only only a small amount of the target antigen to the T cell. 이러한 제제는 생체내 및 생체외 둘다에서 면역자극 제제로서의 감소된 유용성을 갖는다. Such agents have a reduced usefulness as immunostimulatory agents in both in vitro and in vivo. 수지상 세포 제제의 성질을 평가하기 위해 각종 검정이 사용되어 왔다. In order to evaluate the properties of dendritic cell preparations it has various black is used. 이러한 검정은 예를 들면, 제제 내의 수지상 세포의 수 또는 비율(예를 들면, 성숙 및/또는 비성숙), 특정 세포 표면 마커의 존재, 수지상 세포의 표적 항원을 제시하는 능력, T 세포 활성화를 자극하는 능력 등의 측정을 포함한다. This assay is, for example, the number or proportion of dendritic cells in the preparation (e.g., mature and / or non-mature), the presence of certain cell surface markers, stimulation capacity, T-cell activation to present a target antigen of dendritic cells It includes the measurement of the ability of such. APC 제제의 성질을 측정하기 위한 한 방법은 특정 APC-특이적 마커(예를 들면, "수지상 세포" 마커 CD83 및/또는 CD11c)를 나타내는 세포의 수 또는 비율을 측정하는 "면역표현형검사"이다. A measure of the nature of the APC preparation is "immunophenotype" for measuring the number or percentage of representing a particular APC- specific marker (e.g., "dendritic cell" markers CD83 and / or CD11c) cells. 그러나, 면역표현형검사는 T 세포 활성화에 참여하는 제제의 능력에 대해 거의 정보를 제공하지 못한다. However, the immune phenotype test does not provide very little information about the ability of agents to participate in T cell activation. 혼합된 백혈구 반응(MLR)은 동종항원에 대한 백혈구의 반응성을 측정하기 위해 사용되는 검정이다. Mixed leukocyte reaction (MLR) is a test used to measure the reactivity of the white blood cells to the alloantigen. 동종 백혈구(즉, 상이한 HLA 마커를 갖는)는 HLA 마커 사이의 상이함의 정도에 따라, 상이한 정도의 교차반응성을 나타내는 반면, 동계 백혈구(즉, 동일한 HLA 마커를 갖는)는 적은(만약 있다면) 교차반응성을 나타낸다. Allogeneic leukocytes (i.e., having different HLA markers) depending on the degree of different implications between HLA marker, while indicating the cross-reactivity of different degrees, Winter white blood cells (i.e., having the same HLA markers) is less, if any, cross-reactivity It denotes a. 따라서, MLR 반응은 동종항원 교차반응을 측정하는 데 유용하지만, 일반적으로 수지상 세포 제제의 다른 명목상 기능을 측정하는 데는 유용하지 않다. Thus, MLR reaction is useful for measuring the allogeneic antigen cross-reactions, but generally not useful to measure other nominal functions of dendritic cell preparations. 따라서, 수지상 세포 제제의 성질을 측정하는 방법에 대한 필요가 계속되어 왔다. Therefore, it has a need for a method for measuring the properties of the dendritic cell preparation is continued. 본 발명은 이러한 필요 및 그 이상을 만족시킨다. The present invention satisfies these needs and more. 본 발명은 T 세포 자극 또는 피검체에 투여되는 면역자극 조성물의 제제에 사용되는 항원 제시 세포 제제의 성질의 평가 방법을 제공한다. The present invention provides a method of evaluating the nature of the antigen presenting cell preparation used for the preparation of the immunostimulatory composition is administered to the T cell stimulating or subject. 한 양태에서, 항원제시 세포(APC)의 항원-독립적 공동자극 활성을 측정하는 방법을 제공한다. In one embodiment, the antigen of the antigen-presenting cell (APC) - provides a method of measuring the independent co-stimulatory activity. 당해 방법은 공지된 기능 활성을 가지며 실질적으로 공동자극 활성이 없는 T 세포를 제공하는 단계 및 비공지된 공동자극 활성을 갖는 항원제시 세포(APC)의 샘플을 제공하는 단계를 포함한다. The method includes providing a sample of antigen presenting cells (APC) having a phase and a non-known co-stimulatory activity to provide a non-function has a known activity substantially co-stimulates T-cell activity. T 세포를 준최적 농도의 항원-유사제와 접촉시킨다. The optimum concentration gave a T cell antigen is contacted with a similar agent. 또한 T 세포를 비공지된 공동자극 활성의 APC 샘플과 접촉시킨다. In addition, APC is brought into contact with a sample of the co-stimulatory activity for T cell unknown. 이어서, 항원-유사제 및 APC 샘플과 접촉된 T 세포의 활성화를 측정하고 T 세포에 대한 표준 활성화 지수와 비교하여 APC의 항원 독립적 공동자극 활성을 측정한다. Next, antigen - measuring the activation of the T cells contacted with the similar APC and sample and comparison with a standard activation index for the T cells to measure the antigen-independent co-stimulatory activity of the APC. 세포에 의해 수용되고, 처리 및/또는 제시된 예정된 항원의 정성적 또는 정량적 양을 또한 측정할 수 있다. Is received by the cells, the qualitative or quantitative amount of process and / or set out a predetermined antigen can also be measured. 전형적으로, 항원 수용, 처리 및/또는 제시는 예를 들면, 웨스턴 블롯팅(Western blotting), 유동 세포계수법 또는 항원-특이적 T 세포의 활성화에 의해 측정된다. Typically, the antigen receiving, processing and / or presentation, e.g., Western blotting (Western blotting), flow cytometry or antigen is measured by the activation of specific T cells. 본 발명의 방법에 사용된 T 세포는 비공지된 활성을 갖는 항원제시 세포와 동계 또는 동종일 수 있다. The T cells used in the methods of the invention can be antigen-presenting cell with copper or the like having an unknown activity. 전형적으로, 본 발명의 방법에 사용된 T 세포는 말초혈액 단핵 세포로부터 분리된다. Typically, the T cells used in the methods of the invention are isolated from peripheral blood mononuclear cells. 당해 방법에 사용된 T 세포는 이들의 표면에 제II형 MHC, CD14, CD54, CD80, CD83 및/또는 CD86 분자를 발현하는 세포가 고갈된 말초혈액 단핵 세포의 샘플로부터의 T 세포를 포함할 것이다. The T cells used in the method will comprise the T cells from the samples on their surface type II MHC, CD14, CD54, CD80, CD83 and / or CD86 is a cell that expresses a molecule depleted peripheral blood mononuclear cells . 본 발명의 방법에 사용된 항원-유사제는 통상 CD3에 특이적인 항체, 식물 렉틴 또는 비식물 기원 유사분열제과 같은 CD3 결합제이지만, 이에 제한되지는 않는다. The antigen used in the method of the present invention, but is similar to the specific antibody, a plant lectin or a non-plant origin mitosis confectionery such a conventional CD3 CD3 binders, are not limited. 본 발명의 방법에 사용되는 항원 제시 세포는 통상 비성숙 수지상 세포 또는 성숙 수지상 세포이다. Antigen-presenting cells used in the method of the invention will normally be non-mature dendritic cells or mature dendritic cells. 성숙 수지상 세포는 수지상 세포 성숙화제와 생체외에서 접촉한 비성숙 수지상 세포로부터 유래한 것일 수 있다. Mature dendritic cells can be derived from a dendritic cell maturation agent and a non-mature dendritic cells in contact in vitro. 본 발명의 방법 중 T 세포의 활성화는 예를 들면, 증식중인 T 세포의 DNA내로 삽입된 방사선 표지된 티미딘의 양 측정, T 세포 사이토카인(즉, IFNγ또는 인터루킨 2)의 생산 검정 또는 CD25, CD69, CD44 또는 CD125와 같은(이에 제한되지는 않지만) T 세포 활성화 마커의 변화를 검정함으로써 의해 측정될 수 있다. Activation of T cells in the method of the invention for example, production of both measurements, T cell cytokine (i.e., IFNγ or IL-2) of the radiation-labeled thymidine inserted into the DNA of the T cells are proliferating black or CD25, CD69, (but are not limited to), such as CD44 or CD125 may be measured by the change in the black T-cell activation markers. 세포외 또는 세포내 T 세포 사이토카인의 양을 측정할 수 있다. T cells within the extracellular or cell can measure the amount of cytokines. 추가로, T 세포 활성 마커의 변화는 예를 들면, T 세포 활성 마커에 특이적인 표지된 항체를 사용하여 측정할 수 있다. In addition, the change in T cell activation markers, for example, can be measured by using a labeled antibody specific for the T cell activation marker. 본 발명의 방법은 항원제시 세포의 T 세포 활성화를 당해 방법에 사용된 T 세포의 표준 활성화 지수와 비교함으로써 항원 제시 세포의 항원-독립적 공동자극 활성을 측정한다. The method of the present invention by comparison with a standard activation index for the T cells used in the art how the activation of the T cell antigen-presenting cells, the antigen of the antigen presenting cell-independent co-stimulatory activity is measured. 표준 활성화 지수는 역치 값 또는 각각 수지상 세포의 예정된 성질과 관련된 값의 범위로 표현될 수 있다. Standard activation index can be represented by a range of the threshold value or values, respectively related to the predetermined characteristics of dendritic cells. 본 발명의 다른 양태에서, 수지상 세포 제제의 항원-독립적 공동자극 활성을 측정하는 방법을 제공한다. In another aspect of the invention, the antigen of the dendritic cell preparation provides a method for measuring the independent co-stimulatory activity. 당해 방법은 실질적으로 공동자극 활성이 없고 공지된 기능 활성을 갖는 T 세포의 제1 양을 준최적량의 항원-유사제 및 비공지된 공동자극 활성의 수지상 세포 제제의 제1 샘플과 접촉시키는 단계를 포함한다. The method is substantially co-stimulating activity is not having a known functional activity suboptimal for the first quantity of T cells, the amount of antigen-contacting with the first sample of similar first and unknown dendritic cells co-stimulated active agent It includes. T 세포의 제1 양에 대한 제1 활성화 값을 측정한다. Measure the first activation value for the first quantity of T cells. 이어서 T 세포의 제2 양을 수지상 세포 제제의 제2 샘플 또는 준최적량의 항원-유사제와 접촉시키고 T 세포의 제2 양에 대한 제2 활성화 값을 측정한다. In contact with the similar first and measuring a second activation value for the second quantity of T cells - then a second sample or a sub-optimal amount of the antigen of the T second amount of a dendritic cell preparation of the cell. 제1 및 제2 활성화 값을 비교하여 수지상 세포 제제의 공동자극 활성을 측정한다. First comparing the first and second activation values ​​to measure the co-stimulatory activity of the dendritic cell preparation. 본 발명의 다른 양태에서, 수지상 세포 제제의 성질을 측정하는 방법을 제공한다. In another aspect of the invention, there is provided a method of measuring the properties of the dendritic cell preparation. 당해 방법은 예정된 항원에 대한 비공지된 공동자극 활성 및 비공지된 항원제시 능력을 갖는 수지상 세포 제제를 제공하는 단계; The method comprising the steps of: providing a dendritic cell preparation with the unknown co-stimulatory activity and unknown antigen presenting ability for a predetermined antigen; 수지상 세포 제제의 공동자극 활성을 측정하는 단계; Measuring a co-stimulatory activity of the dendritic cell preparation; 및 예정된 항원에 대한 수지상 세포 제제의 항원 제시 능력을 정성적 또는 정량적으로 측정하는 단계를 포함한다. And a step of measuring an antigen-presenting ability of dendritic cells with a predetermined antigen preparation for the qualitative or quantitative. 이들 값을 조합함으로써, 예정된 항원에 대해 T 세포를 활성화시키는 것에 대한 수지상 세포 제제의 성질을 평가할 수 있다. By combining these values, it is possible to evaluate the nature of the dendritic cell preparation for being to activate T cells for the predetermined antigen. 수지상 세포 제제의 공동자극 활성은 공지된 기능 활성을 가지며 실질적으로 공동자극 활성이 없는 T 세포를 제공하고 당해 T 세포와 준최적량의 항원-유사제 및 수지상 세포 제제의 제1 샘플을 접촉시킨 후, 접촉된 T 세포의 활성화를 측정하고 접촉된 T 세포의 측정된 활성화와 T 세포의 표준 활성화 지수를 비교하여 수지상 세포 제제의 공동자극 활성을 측정함으로써 측정할 수 있다. After contacting the first sample of a similar agent and the dendritic cell preparation - dendritic cells co-stimulatory activity has a known function activity substantially provide a T without co-stimulating activity cells, the art T cells and gave the optimal amount of antigen in the formulation , by measuring the activation of the contacted T cells, and comparing the standard activation index of the measured activation of the T cells contacted with the T cells by measuring the co-stimulatory activity of the dendritic cell preparation it can be determined. 수지상 세포 제제에 의한 예정된 항원의 제시는 수지상 세포 제제의 제2 샘플과 예정된 항원을 접촉시키고 예정된 항원이 수지상 세포 제제의 세포에 의해 수용되거나, 처리되거나 수지상 세포 제제의 제2 샘플의 세포의 표면에 제시되었는지의 여부 또는 이의 양을 측정함으로써 측정할 수 있다. Presentation of a predetermined antigen by the dendritic cell preparations to the surface of the cells of the second sample in contact with a predetermined antigen and a second sample and a predetermined antigen or received by the cells of the dendritic cell preparation, treatment, or dendritic cell preparation of the dendritic cell preparation whether the present or by measuring the amount thereof can be determined. 본 발명은 T 세포 자극에 사용하기 위한, 또는 피검체 투여용의 면역자극 조성물로서의 수지상 세포와 같은 항원제시 세포 제제의 성질을 평가하기 위한 방법을 제공한다. The present invention provides a method for assessing the nature of antigen presenting cells such as dendritic cells as an immunostimulatory agent composition for for, or the subject of administration for use in T cell stimulation. T 세포의 항원 독립적 공동자극(또한 공동자극 활성으로 지칭됨) 및 APC에 의한 예정된 항원의 제시에 대한 검정을 APC의 제제의 성질을 측정하기 위해 사용할 수 있다. Antigen-independent co-stimulation of T cells (also referred to as co-stimulatory activity), and an assay for the presentation of a predetermined antigen by the APC may be used to measure the properties of the APC preparations. 한 측면에서, APC의 제제의 성질은 항원-독립적, T 세포 공동자극(또는 효능)검정에 의해 측정할 수 있다. In one aspect, the nature of the APC preparation is antigen-independent and can be measured by a test T-cell co-stimulation (or potency). 통상, 공지된 기능 활성의 T 세포를 항원-특이적 시그날을 모방하는 항원-유사제와 접촉시킨다. In general, the T cells of known functional activity antigen-antigen to mimic the specific signal - is contacted with a similar agent. 또한 당해 T 세포를 비공지된 공동자극 활성의 APC와 접촉시킨다. In addition, the APC is contacted with a co-stimulatory activity known to the art a non-T cell. 이어서 T 세포의 활성화를 측정하고 APC의 성질을 측정하기 위해 사용한다. It is then used to measure the activation of T cells and measuring the properties of APC. 다른 측면에서, APC 제제의 성질은 예정된 항원을 제시하는 APC의 능력에 의해 측정할 수 있다. In another aspect, the nature of the APC preparation can be measured by the ability of the APC to present the predetermined antigen. 통상, APC 제제를 예정된 항원과 접촉시킨다. A conventional, APC preparation is contacted with a predetermined antigen. 항원 수용을 허용하는 적합한 기간 동안 항온처리한 후, APC에 의한 예정된 항원의 제시를 측정할 수 있다. For a suitable period of time to allow the antigen receiving After incubation, it is possible to measure the presentation of the predetermined antigen by the APC. 항원-독립적 T 세포 공동자극 검정에 의한 APC의 성질 측정을 위해, 공지된 기능 활성의 T 세포를 항원-특이적 시그날을 모방하는 항원-유사제와 접촉시킨다. Antigen-independent T cell to measure properties of the APC according to the co-stimulation test, the T cells of known functional activity antigen is contacted with a similar first-antigen to mimic the specific signal. 비공지된 공동자극 활성의 APC를 당해 T 세포와 접촉시키고, 이어서 T 세포의 활성을 측정하고 APC의 성질을 측정하기 위해 사용한다. Ratio and the known art for the APC co-stimulatory activity in contact with the T cells, and was then used to measure the activity of T cells and measuring the properties of APC. T 세포 활성화는 T 세포 및 APC의 공동-배양 중 및/또는 후에 측정할 수 있다. T cell activation is the cavity of the T cell and APC - can be determined during and / or after the incubation. 본원에 사용된 바와 같이, T 세포의 활성화는 APC와의 접촉에 대한 반응으로 인한 하나 이상의 T 세포 기능의 변화를 조사함으로써 평가할 수 있다. As used herein, the activation of T cells can be evaluated by examining changes in one or more T-cell function due to reaction to the contact with the APC. 적합한 T 세포 기능은 예를 들면, 증가된 세포 증식과 연관된 DNA 복제의 증가, 세포외 및/또는 세포내 사이토카인 생산의 변화, T 세포 활성화 마커의 변화 및 T 세포의 항원제시 세포에 대한 기타 반응(예를 들면, 항원-특이적 시그날 및 공동자극 시그날)을 포함한다. Suitable T-cell function, for example, increased cell proliferation, increased DNA replication associated with, the extracellular and / or intracellular cytokine changes in production, and other reactions to antigen presenting cells of a change in T cell activation markers and T cells It includes - (specific signal and the co-stimulation signal, for example, an antigen). 당해 검정에 사용된 T 세포는 강화된 T 세포제제, APC-고갈 T 세포 제제 또는 실질적으로 정제된 T 세포 제제(하기 참조)일 수 있다. The T cells used in the art black may be a T-cell preparation, APC- depletion purified T cell preparations or substantially enhance T cell preparation (see below). 당해 T 세포는 공지된 기능 활성을 갖는다. T cells, the art has a known function activity. 본원에 사용된 바와 같이, 공지된 기능 활성은 동일한 공동자극 시그날(APC로부터의) 및 동일한 농도의 항원-유사제에 대한 T 세포의 재현성 반응을 지칭한다. As used herein, the known function is the same active cavity stimulation signal (from APC) and the same concentration of antigen refers to the reproducibility of the T cell responses to similar agents. 예를 들면, 공지된 기능 활성은 동일한 양의 공동자극 시그날 및 항원-유사제에 대한 반응인, 예정된 증식(예를 들면, 3 H-티미딘의 삽입에 의해 측정된 DNA 복제), 세포외 사이토카인 생산, 세포내 사이토카인 생산 및/또는 T 세포 활성화 마커의 발현일 수 있다. For example, well-known functional activity of co-stimulation signal, and the same amount of antigen in, destined for the proliferative response similar to the (a, for example, measured by the insertion of the 3 H- thymidine DNA replication), the extracellular cytokine It may be the expression of the cytokine production, intracellular cytokine production and / or T cell activation markers. T 세포의 예정된 기능 활성은 본원에 기술한 방법 전, 동시 또는 후에 측정할 수 잇다. Predetermined function of the active T cells piece can be measured by methods described herein before, during or after. 항원-유사제는 예를 들면, 폴리클로날 항체, 모노클로날 항체, 항체의 항원 결합 단편 또는 T 세포 수용체에 결합하고 항원-유사 시그날을 제공할 수 있는 다른 분자일 수 있다. Antigen-like agents include, for example, polyclonal antibody, coupled to a monoclonal antibody, antigen binding fragment of an antibody or T cell receptor monoclonal and antigen may be another molecule that can provide similar signals. 특정 양태에서, 항원-유사제는 CD3 결합 항체와 같은 CD3 결합제, 또는 이의 항원 결합 단편이다. In a particular embodiment, the antigen-like agent is a CD3 binding agent, or an antigen-binding fragment, such as a CD3 binding antibody. 특정 양태에서, CD3 결합제는 T 세포 수용체의 불변 CD3 성분에 결합하는 모노클로날 항체(예를 들면, OKT3)이다. In a particular embodiment, the CD3 binding agent is a monoclonal antibody that binds to the invariant CD3 component of the T cell receptor (for example, OKT3). (예를 들면, 본원에 참조로 인용되어 있는 문헌[Thomas et al., J.Immunol.151:6840-52(1993)]을 참조한다.) 다른 양태에서, CD3 결합제는 CD3 또는 T 세포 수용체의 다른 부위에 결합하는 폴리클로날 항체이며, 항원-특이적 시그날을 모방한다. (For example, in which it is incorporated herein by reference: see [Thomas et al, J.Immunol.151. 6840-52 (1993)]) In another embodiment, the CD3 binding agent is CD3 or T cell receptor and polyclonal antibodies that bind to different sites, antigen-mimic the specific signal. 추가의 양태에서, 항원-유사제는 예를 들면, 준최적 농도에서 APC에 의해 제공된 공동자극 시그날과 결합되어 T 세포를 활성화시키는 자극을 제공하는 식물 렉틴 또는 유사분열제일 수 있다. In a further embodiment, the antigen-like agents include, for example, in combination with co-stimulation signals provided by the APC in a sub-optimal concentration may be a plant lectin or mitosis to provide a stimulus to activate T cells. 그러나, 공동자극 시그날의 부재시, 준최적 농도 또는 양의 식물 렉틴 또는 유사분열제는 최대의 T 세포 활성화를 자극하기에 충분하지 않다. However, in the absence of co-stimulation signal, sub-optimal concentration or amount of a plant lectin or mitotic agent is not sufficient to stimulate the activation of T cells up. 적합한 식물 렉틴은 예를 들면, 콘카나발린(concanavalin) A, 식물적혈구응집소, 밀배아응집소, 억새풀 유사분열제 등을 포함한다. Suitable plant lectins, for example, cone Kana and valine (concanavalin) including A, plant hemagglutinin, wheat germ agglutinin, eoksaepul mitotic agents and the like. 비식물 기원의 적합한 유사분열제는 예를 들면, 스타필로코칼(Staphylococcal) 장독소 A, 스트렙토코칼(Streptococcal) 단백질 A, 포볼 미리스틱 아세테이트(PMA) 등을 포함한다. Suitable mitosis of the non-plant origin include, for example, such as Staphylococcus kokal (Staphylococcal) enterotoxin A, Streptomyces kokal (Streptococcal) protein A, ball four stick acetate advance (PMA). T 세포를 통상 준최적 농도 또는 양의 항원-유사제와 접촉시킨다. Normal T-cell sub-optimal concentration or amount of the antigen - is contacted with a similar agent. 본원에 사용된 바와 같이, "준최적 농도" 또는 "준최적 양"은 혼자서는 최대의 T 세포 활성화를 자극시킬 수 없는 항원-유사제의 농도 또는 양을 지칭한다. As used herein, "sub-optimal concentration" or "sub-optimal amount" is is not possible to stimulate the maximum of T cell activation antigen alone - refers to a concentration or amount of a similar. 전형적인 양태에서, 항원-유사제의 준최적 농도 또는 양은 APC에 의해 제공된 공동자극 시그날의 목적하는 범위에 걸쳐 T 세포에 의해 선형 반응(즉, 활성화)이 일어나게 한다. In an exemplary embodiment, the antigen-linear reaction to occur (that is, activated) by the similarity of the sub-optimal concentration or T cells over a range of desired amount of co-stimulating signals provided by APC. 다른 양태에서, 항원-유사제의 준최적 농도 또는 양은 APC로부터의 공동자극 시그날의 역치 수준 이상으로 T 세포를 활성화시킨다. In another aspect, the antigen-activates the similarity of the sub-optimal concentration or amount of T cell co-stimulation signal of a threshold level or more from the APC. 특정 양태에서, 항-CD3 항체의 적합한 양은 약 0.05 내지 약 20ng/100㎕, 또는 약 50ng/100㎕ 또는 그 이상의 범위일 수 있다. In a particular embodiment, it may be a suitable amount from about 0.05 to about 20ng / 100㎕, or about 50ng / 100㎕ or more of a range of anti -CD3 antibody. 다른 양태에서, 식물 렉틴 및 비식물 기원의 유사분열제의 비최적 농도 또는 양을 사용한다. In another aspect, it uses a non-optimal concentration, or amount of mitotic a plant lectin and non-plant origin claim. 사용되는 식물 렉틴 또는 비식물 기원의 유사분열제의 농도 또는 양은 선택된 조성물에 따를 것이다. The concentration or amount of mitotic of plant lectin or non-plant origin which is used will depend on the selected composition. 식물 렉틴 또는 비식물 기원의 유사분열제의 최적 농도는 통상 당해 분야의 숙련가에게 공지되어 있으며 준최적 농도는 용이하게 선택할 수 있다. The optimum concentration of mitosis of the plant lectin or non-plant origin is the generally well known to those skilled in the art, and optimal concentration gave can easily select. 예를 들면, PHA의 최적 농도는 1 내지 5㎍/㎖이고, 본 발명의 양태에서 1㎍/㎖ 미만은 준최적 농도로 사용될 수 있다. For example, the optimum concentration of PHA is 1 to 5㎍ / ㎖, under 1㎍ / ㎖ in aspects of the present invention can be used as a sub-optimal concentration. 적합한 양 또는 수량의 T 세포 및 APC를 접촉시킬 수 있다. Suitable amounts or quantities, may be brought into contact with the T cell and APC. 특정 양태에서, 당해 검정은 APC 대 T 세포의 낮은 비율로 수행한다. In certain embodiments, the art assay is carried out at a lower rate of APC for T cells. 이러한 비율은 예를 들면 약 1:3 APC 대 T 세포 내지 약 1:100 APC 대 T 세포의 범위일 수 있다. This ratio, for example about 1: may be in the range of 100 APC for T cells: APC for T cells to about 3: 1. T 세포를 APC와 공동배양하기 전에 항원-유사제와 접촉시킬 수 있다. Prior to co-culturing T-cells and APC antigen may be contacted and the like agents. 예를 들면, T 세포를 조직 배양 또는 미세역가 플레이트의 웰 내에 고정시킨 준최적 농도의 항원-유사제와 접촉시킬 수 있다. For example, a sub-optimal concentration of the immobilized T cells in tissue culture or a well of a microtiter plate antigen may be contacted and the like agents. 대안적으로, T 세포, APC 및 항원-유사제를 동일한 시간에 또는 거의 동일한 시점에 접촉시킬 수 있다. Alternatively, T cells, APC and antigen may be contacted to the similar or substantially the same point at the same time. 실시적 양태에서, 항원-유사제를 배양 디쉬(예를 들면, 평저, 96-웰 플레이트)에 고정시킬 수 있다. In an ever embodiment the antigen-like agents of the culture dish can be fixed to (e. G., Pyeongjeo, 96-well plates). 적합한 양의 항원-유사제, 예를 들면, 항-CD3 모노클로날 항체는 예를 들면, 96 웰 플레이트의 웰 당 약 0.1 내지 약 50ng, 또는 그 이상의 범위일 수 있다. The appropriate amount of antigen-like agents, for example, monoclonal antibody to a monoclonal anti -CD3 may be, for example, about 0.1 to about 50ng, or more range per well of a 96 well plate. 고정시킨 후, 통상 당해 웰을 세척하여 비결합된 항원-유사제를 제거한다. After fixing, washing the conventional art well unbound antigen is removed like agents. 다른 양태에서, 다른 항온처리 시간 및 환경을 사용할 수 있다. In another aspect, it is possible to use different incubation time and environment. APC의 적합한 제제는 예를 들면, 수지상 세포 및 단핵구를 포함한다. Suitable agents of APC include, for example, dendritic cells and monocytes. 다른 양태에서, APC는 예를 들면, B 세포, T 세포 또는 상피 또는 내피 세포와 같은 활성화된 비-명목 APC일 수 있다. In another aspect, APC, for example, enable the non-like B cells, T cells, or epithelial or endothelial cells may be a nominal APC. APC는 비성숙하거나 성숙할 수 있다. APC can be a non-mature or mature. APC 및 T 세포를 비록 다소의 시간이 본 발명의 영역내에 있을 수 있지만, 통상 약 6 내지 약 48시간 동안 공동 배양한다. Although the APC and T cells, though some time may be within the scope of the invention will be co-cultured for about 6 to about 48 hours usually. 통상 적합한 시간 동안 공동배양을 수행하여 T 세포를 활성화시키지만, 현저한 수의 비성숙 APC 또는 APC 전구체의 분화 및/또는 성숙에 필요한 시간 미만이다. But usually for an amount of time suitable to perform the co-culture to activate T cells, a significant number of non-mature less than the time required for the differentiation and / or maturation of APC or APC precursors. T 세포 활성화는 T 세포 및 APC의 공동배양 중 및/또는 후에 측정할 수 있다. T cell activation may be measured during and / or after the co-culturing of the T cells and APC. T 세포 활성화에 대한 적합한 검정은 예를 들면, DNA 복제 검정(예를 들면, 3 H-티미딘 삽입), 세포외 및/또는 사이토카인 생산 검정(예를 들면, ELISA, 유동 세포계수법 등) 및 T 세포 활성화 마커 검정(예를 들면, 유동 세포계수)를 포함한다. Suitable assay for T-cell activation, for example, DNA replication assays (e.g., 3 H- thymidine injection), the extracellular and / or cytokine production assays (e.g., ELISA, flow cytometry, etc.) and T cell activation markers and a black (e. g., flow cytometry). T 세포의 활성화는 예를 들면, 표지된 티미딘 삽입(예를 들면, 3 H-티미딘 삽입 또는 다른 적합한 표지)에 의해 측정될 수 있는, DNA 복제와 같은 T 세포 증식과 관련될 수 있다. Of T cell activation, for example, the thymidine inserted into the cover can be associated with T cell proliferation, such as, DNA replication, which can be measured by (for example, 3 H- thymidine insertion or other suitable cover). T 세포 및 APC의 공동 배양물은 약 6 내지 약 24시간 동안 표지물(예를 들면, 3 H-티미딘, 약 1μCi/웰)을 사용하여 펄스시킬 수 있다. Co-culture of T cells and APC water (for example, 3 H- thymidine, about 1μCi / well) for about 6 to about 24 hours, markers can be by using the pulse. 이어서 당해 세포를 수집할 수 있고(예를 들면, 세포 수집기를 사용하여) 삽입된 방사선을 액체섬광분광법으로 측정할 수 있다. Then to collect cells, and the art can insert the radiation (e. G., Using a cell harvester), as determined by liquid scintillation spectroscopy. 특정 양태에서, APC를 T 세포와 공동 배양하기 전에 비활성화시켜 APC DNA 복제를 예방할 수 있다. In certain embodiments, to disable before the APC co-cultured with T cells can prevent the APC DNA replication. 대안적으로, T 세포를 APC로부터 분리한 후, 삽입된 표지량을 측정할 수 있다. Alternatively, after separating the T cells from the APC, it is possible to measure the amount of the inserted cover. 추가의 양태에서, T 세포 활성화는 T 세포 활성화 마커의 변화에 의해 측정할 수 있다. In a further embodiment, T cell activation can be measured by changes in T-cell activation markers. 이러한 마커는 예를 들면, CD25(또한 인터루킨 2 수용체 알파 쇄로 지칭됨), CD69(또한 VEA 또는 AIM으로 지칭됨), CD44(또한 Pgp-1으로 지칭됨), CD125(또한 IL-2 수용체 베타 쇄로 지칭됨) 등을 포함한다. Such markers include, for example, CD25 (also IL-2 receptor alpha swaero referred to), CD69 (also referred to as VEA, or AIM), CD44 (also referred to as Pgp-1), CD125 (also IL-2 receptor beta swaero It includes referred to), and the like. T 세포 활성화 마커의 변화는 예를 들면, 단백질 수준 또는 mRNA 수준의 변화를 측정함으로써 계측할 수 있다. Changes in T cell activation markers, for example, can be measured by measuring the protein levels or a change in mRNA levels. 예를 들면, 단백질 수준내의 변화는 T 세포 활성화 마커, 전사 인자 또는 T 세포 활성화에 연관된 다른 단백질에 대한 표지된 항체를 사용하는 유동 세포계수법, ELISA 또는 웨스턴 블롯팅과 같은 면역검정 등에 의해 측정될 수 있다. For example, changes in the protein levels can be measured by immunoassay, such as flow cytometry, ELISA or Western blotting using a labeled antibody to other proteins involved in T cell activation markers, transcription factors, or T cell activation have. mRNA 수준의 변화는 T 세포 활성화 마커, 전사 인자 등을 암호화하는 메시지에 대해 측정할 수 있다. Changes in mRNA levels can be determined for the message coding for the T cell activation markers, transcription factors and the like. mRNA 수준은 예를 들면, 노던 블롯팅, 폴리머라제 연쇄 반응(예를 들면, RT-PCR), 다른 하이브리드화 검정(예를 들면, GeneChip R 프로브 배열을 사용한 검정 등) 또는 기타 검정에 의해 측정될 수 있다. mRNA level, e.g., Northern blotting, polymerase chain reaction (e.g., RT-PCR), other hybridization assays (e.g., test using a GeneChip R probe array, etc.) or any other, as measured by the black can. (예를 들면, 본원에 참조로서 인용된 문헌[Sambrook et al., Molecular Cloning, A Laboratory Manual, 3rd ed., Cold Spring Harbor Publish., Cold Spring Harbor, NY(2001); Ausubel et al., Current Protocols in Molecular Biology, 4th ed., John Wiley and Sons, New York(1999)]; 미국 특허 번호: 제5,444,934호; 제5,532,128호; 제5,556,752호; 제5,242,974호; 제5,384,261호; 제5,405,783호; 제5,412,087호; 제5,424,186호; 제5,429,807호; 제5,436,327호; 제5,472,672호; 제5,527,681호; 제5,529,756호; 제5,545,531호; 제5,554,501호; 제5,561,071호; 제5,571,639호; 제5,593,839호; 제5,599,695호; 제5,624,711호; 제5,658,734호; 및 제5,700,637호를 참조한다.) (E.g., documents cited herein by reference [Sambrook et al, Molecular Cloning, A Laboratory Manual, 3rd ed, Cold Spring Harbor Publish, Cold Spring Harbor, NY (2001);.... Ausubel et al, Current . Protocols in Molecular Biology, 4th ed, John Wiley and Sons, New York (1999)]; U.S. Patent No. : 5,444,934 call; claim 5532128 call; claim 5556752 call; claim 5242974 call; claim 5384261 call; claim 5405783 call; the 5,412,087 call; claim 5424186 call; claim 5429807 call; claim 5436327 call; claim 5472672 call; claim 5527681 call; claim 5529756 call; claim 5545531 call; claim 5554501 call; claim 5561071 call; claim 5571639 call; claim 5593839 call; claim 5,599,695 No. ; refers to, and the number 5700637); the No. 5,624,711; No. 5,658,734 arc. 활성화 검정(측정 활성화)에 의해 측정된 T 세포의 활성화를 임의로 단독의 항원-유사제, 및/또는 APC와 접촉시킨 T 세포의 배경 활성화에 의해 조정(즉, 감소)할 수 있다. Activation test of a single activation of the T cells as measured by the (measured active) optionally antigen-like agents, and / or adjusted by the background activation of the T cells were in contact with the APC can be (that is, reduced). 추가로, 활성화를 T 세포 제제내의 비-T 세포(예를 들면, B 세포, NK 세포 등)의 배경 수준에 대해 임의로 조정할 수 있다. In addition, the non -T cells in the T cell activating agent can be adjusted optionally to the background level (e. G., B cells, NK cells, etc.). 측정된 활성화(배경 활성화의 공제 유무)를 T 세포에 대한 표준 활성화 지수와 비교하여 APC(예를 들면, 수지상 세포)의 공동자극 활성을 측정할 수 있다. It can be compared to the measured active (enabled or without subtraction of background) and the standard activation index for the T cells to determine the co-stimulatory activity of the APC (e.g., dendritic cells). 본원에 사용된 바와 같이, 표준 활성화 지수는 APC의 항원 독립적, 공동자극 활성을 사용하거나 이와 관련될 수 있는 정량적 값 또는 일련의 값을 지칭할 수 있다. As used herein, the standard activation index can refer to a quantitative value or set of values ​​used in an antigen independent, co-stimulatory activity of the APC or may be this regard. 예를 들면, 표준 활성화 지수는 역치 값일 수 있다(예를 들면, 3 H-티미딘 삽입 수준, 세포외 또는 세포내 사이토카인 생산 수준 또는 하나 이상의 T 세포 활성화 마커의 존재 및/또는 부재). For example, the standard activation index can be a value threshold (e.g., 3 H- thymidine insertion level, presence and / or absence of an extracellular or intracellular cytokine production or level of one or more T cell activation markers). 또한 표준 활성화 지수는 APC에 의한 T 세포 공동자극의 상이한 수준과 관련된 일련의 값일 수 있다(예를 들면, 3 H-티미딘 삽입의 상이한 양, 세포외 또는 세포내 사이토카인 생산량 또는 T 세포 활성화 마커(들)의 존재 및/또는 부재). In addition, the standard activation index can be a value related to a series of different levels of T cell co-stimulation by the APC (e.g., 3 H- thymidine different amounts of extracellular or intracellular cytokine production or T cell activation markers in the insertion presence and / or absence of a (s)). 다른 양태에서, 표준 활성화 지수는 정성적일 수 있다(예를 들면, 하나 이상의 T 세포 활성화 마커의 존재 및/또는 부재, 사이토카인 생산의 존재 또는 부재 등). In other embodiments, the standard activation index have proven to be qualitative (e.g., presence of one or more T cell activation markers, and / or members, cytokines in the presence or absence of cytokine production, etc.). 예를 들면, 특정 양태에서, 표준 활성화 지수는 T 세포 활성화 정도 또는 수준을 측정하기 위한 15,000 cpm의 3 H-티미딘 삽입과 관련될 수 있으며, 이는 APC의 공동자극(또는 효능)의 정도 또는 수준에 직접적으로 비례할 수 있다. For example, in certain embodiments, the standard activation index can be associated with a 3 H- thymidine insertion of 15,000 cpm for measuring the degree of activation or T cell level, which level or levels of co-stimulation (or potency) of the APC the can directly proportional. 특정 양태에서, 표준 활성화 지수는 APC(비공지된 효능의)와 T 세포 및 항-CD3 항체의 접촉으로 기인한 활성화(예를 들면, cpm) 대 T 세포 및 항-CD3 항체의 접촉(APC 없이)으로 기인한 활성화의 비율로서 측정될 수 있다. In certain embodiments, the standard activation index APC (of unknown efficacy) and T cells, and wherein the contact is enabled due to the -CD3 antibody (e. G., Cpm) versus T cells, and wherein contact of the -CD3 antibody (no APC ) it may be measured as the ratio of the activation caused by. 수득된 값은 APC 공동자극 활성 또는 효능의 지수일 수 있다. The obtained value can be an index of the APC co-stimulatory activity or efficacy. 표준 활성화 지수는 T 세포의 개별 제제를 사용하여 측정하거나 하나 이상의 T 세포 제제를 기준으로 하여 표준화시킬 수 있다. Standard activation index can be standardized based on the measurement or at least one T cell preparation using a separate preparation of the T cell. 특정 양태에서, 표준 활성화 지수는 참조 T 세포 제제 또는 T 세포주 및 참조 APC 제제 또는 APC 세포주를 사용하여 측정할 수 있다. In certain embodiments, the standard activation index can be determined using a reference preparation, or T cell lines T cells and APC reference formulation or APC cell line. 측정된 활성화 및 상응하는 표준 활성화 지수(또는 지수들)은 전형적으로 APC의 공동자극 활성에 직접적으로 비례한다. (Or index) the measured activated and the corresponding standard activation index, which is typically directly proportional to the co-stimulatory activity of the APC. 따라서, APC 공동자극 활성은 예를 들면, 조사, 동물 연구, 임상 시험 및 다른 기타 임상학적 용도를 위해 APC를 정성화하는 데 사용될 수 있다. Thus, APC co-stimulatory activity, for example, may be used to Jung Sung-hwa the APC to investigate animal studies, clinical trials, and any other clinical purposes. 추가로, APC 공동자극 활성 검정은 APC 제제의 일관성을 측정하기 위해 사용하거나 APC 제품(예를 들면, 세포성 백신 제품)에 대한 품질 관리 검정으로 사용할 수 있다. In addition, APC co-stimulating activity assay may be used to measure the consistency of the APC preparation and use in quality control assay for APC products (for example, a cellular vaccine product). 본 발명의 다른 측면에 따라, APC 제제에 의한 예정된 항원의 제시를 측정함으로써 APC의 제제의 성질을 측정하기 위한 방법을 제공한다. According to a further aspect of the present invention, by measuring the presentation of a predetermined antigen by the APC preparation provides a method for measuring the properties of the APC preparations. 위에 개시한 바와 같이, APC의 제제는 항원을 수용, 처리 및 제시하는 이들의 능력에 있어 다양할 수 있다. As disclosed above, the APC preparations may vary in their ability to accommodate the antigen processing and presentation. 예를 들면, 성숙한 수지상 세포는 일반적으로 신규한 항원을 수용, 처리 및 제시하는 감소된 능력을 나타낸다. For example, mature dendritic cells show a reduced ability to generally accommodate a novel antigen processing and presentation. 대조적으로, 비성숙 수지상 세포는 일반적으로 항원을 효과적으로 수용하지만, 성숙시까지 항원을 효과적으로 처리 및 제시하지는 않는다. In contrast, non-mature dendritic cells are generally effectively accommodate the antigen but, until maturation does not effectively process and present the antigen. 항원 제시는 검정될 세포 유형에 따라, 특정한 예정된 항원, 또는 항원의 그룹 또는 샘플을 수용, 처리 및 제시하는 APC의 능력의 측정 기준일 수 있거나, 이와 관련될 수 있다. Antigen presentation is a particular predetermined antigen, or may receive a date of measurement sample or group of antigens, and a process of presenting APC ability, in this regard may be depending on the cell type to be black. 항원 제시를 측정하기 위해, APC의 샘플을 하나 이상의 예정된 항원과 접촉시킬 수 있다. To measure antigen presentation, it is possible to contact the sample of APC and one or more predetermined antigens. APC를 배양하여 예정된 항원(또는 이의 에피토프)을 수용 및 임의로, 처리 및/또는 제시하도록 배양시킬 수 있다. Culturing the APC with a predetermined antigen (or epitope thereof) containing and optionally, can be cultured so as to process and / or present. APC에 의해 제시된 예정된 항원의 양은 예를 들면, APC 내의 하중 및/또는 처리의 측정에 의한 제시, 및/또는 통상 MHC 분자와 관련된, APC의 표면상의 제시와 관련될 수 있다. The amount of predetermined antigen presented by the APC, for example, can be related to the present, and / or presented on the APC surface, associated with the MHC molecules by the normal load and / or the measurement of the processing in the APC. 이들 검정은 총체적으로 "제시 검정" 또는 "제시"로 지칭된다. These assays are collectively referred to as "present black" or "present". 예정된 항원은 예를 들면, 세균 또는 바이러스 항원, 종양-특이적 또는 종양-관련 항원(예를 들면, 종양 세포 용해물, 종양 세포 막 제제, 종양으로부터 분리된 항원(들), 융합 단백질 또는 리포좀) 또는 다른 항원일 수 있다. A predetermined antigen, e.g., a bacterial or viral antigen, a tumor-specific or tumor-associated antigens (e. G., The antigen (s), fusion proteins, or liposomes separated from a tumor cell lysate, tumor cell membrane preparation, tumor for) or it may be a different antigen. 예시적 양태에서, 항원은 전립선 특이적 막 항원(PSMA)이다. In an exemplary embodiment, the antigen is a prostate specific membrane antigen (PSMA). 추가의 양태에서, 예정된 항원의 제시는 APC의 표면상에 제시된 항원(또는 이의 에피토프)를 검출함으로써 측정할 수 있다. In a further aspect, the presentation of a predetermined antigen can be measured by detecting the antigen (or their epitopes) presented on the surface of the APC. 예를 들면, 예정된 항원과 접촉된 APC를 삼투압 충격 등에 의해 가용성 제제(예를 들면, TWEEN R , 나트륨 도데실 설페이트 또는 NP40 R )로 처리할 수 있다. For example, it can be treated with soluble agents (e.g., TWEEN R, sodium dodecyl sulfate or NP40 R) by the APC in contact with a predetermined antigen osmotic shock or the like. 방출된 항원(또는 이의 에피토프(들)은 예를 들면, 면역검정(예를 들면, ELISA, 면역검정 등)에 의해 검출될 수 있다. 예정된 항원 또는 항체는 임의로 검출가능하게 표지시킬 수 있으며(예를 들면, 방사선동위원소, 형광단, 화학발광 표지, 효소 등을 사용하여), 방출된 항원은 적합한 검출 방법(예를 들면, 섬광계수법)을 사용하여 검출할 수 있다. The released antigen (or its epitope (s), for example, immunoassay (e.g., ELISA, can be detected by immunoassay, etc.) a predetermined antigen or antibody may be labeled detectably optionally (e for example, radioactive isotopes, by using a fluorophore, a chemiluminescent label, an enzyme, etc. ), the released antigen can be detected using a suitable detection method (e.g., scintillation counting method). 관련 양태에서, 항원 제시는 유동 세포계수법으로 측정할 수 있다. In a related aspect, antigen presentation can be measured by flow cytometry. 예를 들면, APC를 예정된 항원과 접촉시키킨 후 적합한 기간 동안 항온처리하고, 접촉된 APC를 항원 특이적 표지로 염색하고 세포 표면에 제시된 항원의 양을 검출할 수 있다. For example, contacting the APC with a predetermined antigen either incubated for a suitable period of time after Keane, and dyeing the contact APC in antigen specific marker and to detect the amount of antigen presented on the cell surface. 적합한 표지는 예를 들면, 표지된 항체 또는 항원에 특이적인 다른 결합제 또는 이의 일부이다. Suitable markers are, for example, is specific for the other binding agent or a portion thereof, in a labeled antibody or antigen. 항원 제시는 또한 항원-특이적 T 세포주와 같은, 항원-특이적 T 세포를 사용함으로써 측정할 수 있다. Antigen presentation also antigen can be measured by using a specific T cells, such as antigen specific T cell lines. APC를, 항원을 수용, 처리 및 제시하도록, 예정된 항원과 접촉시키고 배양할 수 있다. The APC, it is possible to accommodate to the Antigen, processing and presentation, it is contacted with a predetermined antigen the culture. 항원 제시는 본원에 기재된 바와 같이, 항원-특이적 T 세포의 활성화를 계측함으로써 측정할 수 있다(예를 들면, DNA 복제, 세포외 또는 세포내 사이토카인 생산, T 세포 활성화 등을 측정함으로써). As antigen-presenting is described herein, the antigen can be determined by measuring the activation of specific T cells (for example, by measuring the g., DNA replication, an extracellular or intracellular cytokine production, T cell activation, etc.). 본 발명의 방법에 따라 사용하기 위한 T 세포를 당해 분야에 공지된 방법에 따라 제조할 수 있다. Art T cells for use in accordance with the method of the present invention can be prepared according to methods known in the art. 항원-독립적 공동자극 검정을 위해, T 세포는 강화된 T 세포 제제, APC-고갈 T 세포 제제 또는 실질적으로 정제된 T 세포 제제(하기 참조)일 수 있다. Antigen-independent co-stimulation for the black, T cells may be a T-cell preparation, the purified APC- depleted T cell preparation or a substantially enhance T cell preparation (see below). T 세포 또는 T 세포의 서브세트는 각종 림프성 조직으로부터 수득할 수 있다. Subset of T cells or T cells can be obtained from various lymphoid tissues. 이러한 조직은 비장, 림프절 및 말초 혈액을 포함하지만, 이에 제한되지는 않는다. These organizations including the spleen, lymph node and peripheral blood, but are not limited to. T 세포는 혼합된 T 세포 집단 또는 정제된 T 세포 서브세트일 수 있다. T cells may be a population of mixed T cell or purified T cell subset. 특정 양태에서, T 세포는 T 세포의 수 또는 퍼센트가 T 세포의 분리된 집단의 측면에서 증가된 강화된 T 세포 제제이다. In certain embodiments, T cells are T cells, the enhanced formulation increases from the side of the separate groups of the number or percentage of T cells T cells. 다른 양태에서, T 세포는 실질적으로 APC가 없으며, 대부분의 APC(예를 들면, >75%)는 T 세포로부터 분리되어 있다. In another embodiment, T cells are not substantially APC, most APC (e. G.,> 75%) is separated from the T cells. 실시적 양태에서, 말초 혈액 단핵 세포(PBMC)는 헤파린화된 바이알내에서와 같이 혈액으로부터 수득될 수 있다. In an ever aspect, peripheral blood mononuclear cells (PBMC) can be obtained from blood, such as within a heparinized vials. PBMC는 원심분리에 의해 적혈구로부터 분리될 수 있으며(예를 들면, HISTOPAQUE R 1077(Sigma Aldrich Co.)) PBMC는 접촉면으로부터 회수된다. PBMC can be separated from the red cells by centrifugation and (e. G., HISTOPAQUE R 1077 (Sigma Aldrich Co. )) PBMC are recovered from the contact surface. 회수한 PBMC는 임의로 세척할 수 있다(예를 들면, PBS를 사용하여). The recovered PBMC may optionally washing (e.g., using the PBS). 예를 들면, CD2, CD3, CD4, CD5, CD8, CD14, CD19 및/또는 제 II형 MHC 분자에 대해 지시된 항체의 사용을 포함한(이에 제한되지는 않음) 양성 또는 음성 선택에 의해, T 세포 정제를 수행할 수 있다. For example, CD2, CD3, CD4, CD5, CD8, CD14, CD19 and / or but is not limited to the type II MHC molecules, including the use of the indicated antibody-positive or, T cells by negative selection It may perform the purification. 본 발명에 유용한 T 세포 제제는 통상 CD4 + 또는 CD4 + 및 CD8 + 의 혼합된 집단이다. T cells useful agents in the present invention is a mixed population of normal CD4 + or CD4 + and CD8 +. 특정 양태에서, T 세포 집단은 약 50% 이상의 T 세포를 함유한다. In certain embodiments, the T cell population contains at least about 50% T cells. 추가의 양태에서, T 세포는 분리된 T 세포주일 수 있다. In a further embodiment, T cells can be separated week T cell. APC-고갈 T 세포는 공동자극 시그날을 제거하는 것으로부터 제조할 수 있다. APC- deplete T cells can be made from having to remove the co-stimulation signal. 공동자극 시그날은 예를 들면, 제II형 MHC 분자에 대한 항체를 사용하여 "패닝"시킴으로써 제거할 수 있다. Co-stimulation signal is, for example, using antibodies to type II MHC molecules may be removed by "panning". 예를 들면, T 세포 또는 PBMC를 제II형 MHC 분자에 특이적인 항체에 커플링시킨 자성 비드와 접촉시켜 공동자극 시그날을 제거할 수 있다. For example, it is possible to remove the co-stimulation signal is contacted with the magnetic beads was coupled to an antibody specific for T cells or PBMC in type II MHC molecules. 본원에 사용된 바와 같이, 실질적으로 공동자극 시그날이 없는 T 세포는 무의미한 수준의 T 세포 활성화를 나타낸다(예를 들면, 충분히 활성화된 T 세포의 활성화의 약 5% 미만 또는 약 1% 미만). As used herein, the substantially T-cells without co-stimulating signals represents an insignificant level of T cell activation (e. G., Less than about 5% of the activation of the fully activated T cells or less than about 1%). 사람 및 사람외 영장류, 다른 포유 동물 및 척추동물을 포함하여, 각종 제공원으로부터 APC를 제조할 수 있다. More people and people, including primates, other mammals and vertebrates, the APC can be produced from a variety of available sources. 특정 양태에서, APC는 사람 또는 사람외 척추동물의 혈액으로부터 제조할 수 있다. In certain embodiments, APC may be made from other vertebrates or man human blood. 또한 APC는 백혈구의 강화된 집단으로부터 분리할 수 있다. In addition, APC may be isolated from an enhanced population of white blood cells. 백혈구의 집단은 당해 분야의 숙련가에게 공지된 방법에 의해 제조할 수 있다. Group of white blood cells may be prepared by methods known to those skilled in the art. 이러한 방법은 전형적으로 헤파린화된 혈액 수집, 아페레시스(apheresis) 또는 백혈구 아페레시스, 백혈구연층 제조, 로젯팅, 원심분리, 밀도구배 원심분리(예를 들면, Ficoll(FICOLL-PAQUE R 와 같은), PERCOLL R (콜로이드성 실리카 입자), 슈크로스 등을 사용), 비백혈구 세포의 분별 용해, 여과 등을 포함한다. This method typically heparinized blood collection, Oh Ferre system (apheresis) or white blood cell Oh Ferre system, leukocytes yeoncheung manufactured by jetting, centrifugation, density gradient centrifugation (e. G., Such as Ficoll (FICOLL-PAQUE R ), PERCOLL R (using colloidal silica particles), sucrose and the like), comprises a fractional dissolution of the non-leukocyte cells, filtration and the like. 또한 백혈구 집단은 피검체로부터 혈액을 수집하고, 탈피브린화하여 혈소판을 제거하고 적혈구를 용해시켜 제조할 수 있다. In addition, white blood cell group can collect the blood from the subject, and the break Dublin granulation to remove platelets, and prepared by dissolving the red blood cells. 당해 백혈구 집단은 또한 단핵성 수지상 세포 전구체에 대해 임의로 강화시킬 수 있다. Art leukocyte population can also be optionally reinforced for only nucleophilic dendritic cell precursors. 혈액 세포 집단은 백혈구의 강화된 집단의 바람직한 용도에 따라, 각종 피검체로부터 수득할 수 있다. Blood cell population, can be obtained from various test body in accordance with the preferred use of the enhanced population of white blood cells. 당해 피검체는 건강한 피검체일 수 있다. Art a subject may be a healthy subject. 대안적으로, 혈액 세포를 예를 들면, 암 환자 또는 면역자극이 유리할 것인 다른 환자와 같이, 면역자극을 필요로하는 피검체로부터 수득할 수 있다. Alternatively, the blood cells, for example, can be obtained from the subject who need an immune stimulation, such as other patients would be advantageous is a cancer patient or immunostimulatory. 또한, 혈액 세포는 예를 들면, 자가면역 장애(예를 들면, 류마티스 관절염, 당뇨병, 루푸스, 다발성경화증 등)을 갖는 환자와 같이 면역 억제를 필요로하는 피검체로부터 수득할 수 있다. In addition, blood cells, for example, can be obtained from the subject in need of immunosuppression, such as patients with autoimmune disorders (e.g., rheumatoid arthritis, diabetes, lupus, multiple sclerosis, etc.). 또한 백혈구 집단은 HLA-매치된 건강한 개인으로부터 수득할 수 있다. In addition, the leukocyte populations can be obtained from a healthy individual match HLA-. 특정 양태에서, 단핵성 수지상 세포 전구체는 예를 들면, 강화된 백혈구 또는 단백구와 단핵성 수지상 세포 전구체 부착 기질을 접촉시켜 분리할 수 있다. In certain embodiments, a short-nucleophilic dendritic cell precursors can be isolated, for example, enhanced white blood cell or protein sphere and contacting the dendritic cell precursors stage nucleophilic attachment substrate. (예를 들면, 본원에 참조로서 인용되어 있는 문헌인, 미국 가특허 출원 제60/307,978호(2001, 7월 25일 출원)을 참조한다). (For example, a literature of, the United States, which is incorporated herein by reference, see Patent Application No. 60 / No. 307 978 (2001, July 25 application)). 간략하게, 강화된 백혈구 또는 단핵구의 집단이 기질과 접촉된 경우, 세포 집단내의 단핵성 수지상 세포 전구체, 또는 단핵구는 기질에 부착된다. If the brief, enhance white blood cell or population of mononuclear cells in contact with the substrate, the cell only nucleophilic groups in the dendritic cell precursors, mononuclear cells, or is attached to a substrate. 다른 백혈구는 기질에 대한 감소된 결합 친화성을 나타내며, 이에 따라 단핵성 수지상 세포 전구체가 기질의 표면상에서 우선적으로 강화되게 한다. Other white blood cells indicates a decreased binding affinity for the substrate, allowing the end-nucleophilic dendritic cell precursors are preferentially enhanced on the surface of the substrate accordingly. 적합한 기질은 예를 들면, 유리 입자, 플라스틱 입자, 유리-피복된 플라스틱 입자, 유리-피복된 폴리스티렌 입자, 미세모관 및 미세융모막과 같은 입자성 기질을 포함한다. Suitable substrates are, for example, glass particles, plastic particles, glass-includes particulate substrates such as polystyrene particles, and the fine tube misemo chorionic coating-coated plastic particles, glass. 당해 기질의 표면을 임의로 단핵성 수지상 세포 전구체의 기질에 대한 부착력을 증강시키도록 처리할 수 있다. It may be treated to enhance the adhesion to the substrate of the end surfaces of the substrate optionally nucleophilic dendritic cell precursors. 당해 기질의 표면은 예를 들면, 단백질; Surfaces of the substrate, for example, proteins; 사이토카인(예를 들면, 과립백혈구/대식세포 콜로니 자극 인자, 인터루킨 4 및/또는 인터루킨 13); Cytokines (e. G., Granular leukocytes / macrophage colony-stimulating factor, interleukin-4 and / or IL-13); 혈장(예를 들면, 자가 또는 동종 혈장); Plasma (e. G., Autologous or homologous plasma); 단핵성-결합 단백질 등으로 피복시킬 수 있다. However nucleophilic - it can be covered with such binding proteins. 백혈구- 또는 단핵구-강화 세포 집단을 단핵성 수지상 세포 전구체 부착 기질과 접촉시킨 후, 단핵성 수지상 세포 전구체를 기질에 부착시켜 기질상에 단핵성 수지상 세포 전구체를 포함하는 복합체를 형성한다. White blood cell - or monocyte-then contacted with a population of cells enhanced end-nucleophilic dendritic cell precursors attached substrate, by attaching a single-nucleophilic dendritic cell precursors to the substrate to form a complex comprising a single-nucleophilic dendritic cell precursors on the substrate. 단핵성 수지상 세포 전구체 결합을 예를 들면, 항-세포 표면 마커 항체(예: 항-CD14 항체)를 사용하는 항체 검출, FACS 전방 및 측면 산란 분석 등에 의해 관찰할 수 있다. The only nucleophilic dendritic cell precursors, for example coupling, the anti-cell surface marker antibody: may be observed by antibody detection, FACS forward and side scatter analysis using a (for example, anti -CD14 antibody). 일부 양태에서, 백혈구 집단을 기질과 약 5 내지 약 300분 동안, 보다 전형적으로는 약 30 내지 약 120분 동안 접촉시킨다. In some embodiments, while the white blood cell population substrate and from about 5 to about 300 minutes, thereby more typically contacted for about 30 to about 120 minutes. 단핵성 수지상 세포 전구체 복합체는 임의로 적합한 세척 완충액을 사용하여 세척하여 비-특이적으로 결합한 백혈구를 제거할 수 있다. However nucleophilic dendritic cell precursor complex is washed using a suitable washing buffer, optionally non-white blood cells can be removed by combining specific. 적합한 세척 완충액은 조직 배양 배지(예를 들면, AIM-V, RPMI 1640, DMEM, X-VIVO 15 등), 인산완충염, Dulbecco 인산완충염 등이 포함된다. A suitable wash buffer, and the like is tissue culture medium (e.g., AIM-V, RPMI 1640, DMEM, X-VIVO 15, etc. ), phosphate buffered saline, Dulbecco phosphate buffer salt. 당해 배지를 아미노산, 비타민 및/또는 호르몬 등으로 보충하여 단핵성 수지상 세포 전구체의 생존능 및/또는 증식을 촉진시킬 수 있다. By supplementing the medium with amino acids the art, such as vitamins and / or hormones may promote the viability and / or proliferation of the short-nucleophilic dendritic cell precursors. 세척 효능은 세척 완충액의 FACS 전방 및 측면 산란 분석, 세포 표면 마커에 대한 용출된 세포의 염색 등에 의해 관찰할 수 있다. Cleaning efficacy can be observed or the like of the eluted cells to a washing buffer FACS forward and side scatter analysis, and cell surface marker staining. 통상, 당해 복합체를 수회 세척하여 비특이적으로 결합된 백혈구를 제거한다. Three conventional, art complex several times to remove the white blood cells as non-specific binding. 부착된 단핵성 수지상 세포 전구체를 기질로부터 용출시킬 수 있다. A mounting end-nucleophilic dendritic cell precursors can be eluted from the substrate. 예를 들면, 당해 전구체를 0.4% EDTA 또는 다른 무독성 킬레이트 제제를 함유하는 인산완충염으로 처리하여 기질로부터 용출시킬 수 있다. For example, by treating the precursor in the art phosphate-buffered salt containing 0.4% EDTA, or other non-toxic chelating agent it can be eluted from the substrate. 단핵성 수지상 세포 전구체를 통상 트립신 또는 다른 프로테아제를 사용하지 않고 기질로부터 용출시킨다. However nucleophilic eluted dendritic cell precursors from the substrate without using the normal trypsin or other proteases. 다른 양태에서, 수지상 세포를 당해 분야의 숙련가에게 공지된 다른 방법에 따라 분리할 수 있다. In another aspect, it can be isolated according to other methods known to those skilled in the art for dendritic cells. (예를 들면, 본원에 참조로서 인용되어 있는 문헌[O'Doherty et al., J.Exp.Med.178:1067-76(1993); Young and Steinman, J. Exp. Med.171:1315-32(1990); Freudenthal and Steinman, Proc. Natl. Acad. Sci. USA 87:7698-702(1990); Macatonia et al., Immunol. 67:285-89(1989); Markowicz and Engleman, J.Clin.Invest. 85:955-61(1990); 미국 특허 제5,994, 126호 및 제5,851,756호]를 참조한다.) 수지상 세포를 면역-선택하기 위한 방법에는 예를 들면, 수지상 세포 전구체와 관련된 세포 표면 마커에 대한 항체, 예를 들면, 기질에 커플링된 항-CD34 및/또는 항-CD14 항체(예를 들면, 문헌[Bernhard et al., CancerRes. 55:1099-104(1995); Caux et al., Nature 360:258-61(1992)를 참조한다) 또는 충분히 분화된 수지상 세포와 관련된 세포 표면 마커(예를 들면, CD11c, CD54, CD83, CD80, CD86 등)에 대한 항체를 사용하는 것을 포함한다. (For example, in which is incorporated herein by reference [O'Doherty et al, J.Exp.Med.178:.. 1067-76 (1993); Young and Steinman, J. Exp Med.171: 1315- 32 (1990); Freudenthal and Steinman, Proc Natl Acad Sci USA 87: 7698-702 (1990); Macatonia et al, Immunol 67:...... 285-89 (1989); Markowicz and Engleman, J.Clin . .Invest 85:. 955-61 (1990); U.S. Patent No. 5 994, 126 and No. 5,851,756 with reference to the call;) immune dendritic cells - method for selecting include, for example, cell surface associated with dendritic cell precursors antibody to a marker, e.g., wherein the coupling to the substrate -CD34 and / or anti -CD14 antibody (for example, in [Bernhard et al, CancerRes 55:.. 1099-104 (1995); Caux et al ., Nature 360: 258-61 refers to the (1992)) or a cell surface marker associated with a fully differentiated dendritic cells (e. g., including the use of antibodies to CD11c, CD54, CD83, CD80, CD86, etc.) do. 다른 양태에서, APC는 염증 또는 다른 활성화 조건하의 비명목 APC일 수 있다. In another aspect, APC may be a screaming neck APC under inflammatory or other activating conditions. 예를 들면, 비명목 APC는 인터페론-감마, T 세포, B 세포 및/또는 APC 활성을 유도하는 인자 또는 조건에 의해 활성화된 단핵구를 사용하여 자극시킨 상피 세포를 포함할 수 있다. For example, a screaming neck APC is interferon-gamma may include, T cells, B cells and / or epithelial cells were stimulated using the monocyte activation by the factor or conditions that result in the APC activity. 이러한 비명목 APC는 당해 분야에 공지된 방법에 따라 제조될 수 있다. These screams neck APC may be prepared according to methods known in the art. 특정 양태에서, APC를 적합한 배양 또는 성장 배지 내에서 배양시켜 제제 내의 APC의 수를 유지시키고/거나 증폭시킬 수 있다. In certain embodiments, the culture was incubated in a suitable growth medium or the APC and to maintain the number of APC in the formulation and / or can be amplified. 배양 배지를 분리된 APC 유형에 따라 선택할 수 있다. It can be selected according to the type of APC to remove the culture media. 예를 들면, 성숙한 수지상 세포와 같은 성숙한 APC를 이들의 유지 및 증폭에 적합한 성장 배지(예를 들면, AIM-V, RPMI 1640, DMEM, X-VIVO 15 등)내에서 배양시킬 수 있다. For example, it is possible to culture in the mature dendritic cells with a growth medium suitable for the APC, such as a mature thereof maintained and amplification (for example, AIM-V, RPMI 1640, DMEM, X-VIVO 15, and so on). 배양 배지를 아미노산, 비타민, 항생제, 이가양이온 등으로 보충할 수 있다. The culture medium amino acids, vitamins, antibiotics, divalent cations such as may be supplemented with. 추가로, 사이토카인, 성장 인자 및/또는 호르몬을 성장 배지내에 포함시킬 수 있다. In addition, it can include cytokines, growth factors and / or hormones in the growth medium. 예를 들면, 성숙한 수지상 세포의 유지 및/또는 증폭을 위해, 과립백혈구/대식세포 콜로니 자극 인자(GM-CSF) 및/또는 인터루킨 4(IL-4)와 같은 사이토카인을 통상 약 500단위/㎖의 농도로 첨가할 수 있다. For example, the mature maintenance of dendritic cells and / or for amplification, granular leukocytes / macrophage colony-stimulating factor (GM-CSF) and / or interleukin-4 (IL-4) normal to a cytokine, such as about 500 units / ㎖ of it can be added at a concentration. 다른 양태에서, 비성숙 APC를 배양 및/또는 증폭시킬 수 있다. In another aspect, the non-mature APC can be cultured and / or amplification. 비성숙 수지상 세포는 이들이 신규한 항원을 수용 및 처리하는 능력을 유지하기 때문에 본 발명의 특정 측면에 바람직할 수 있다. Non-matured dendritic cells can be preferred in certain aspects of the present invention because they maintain the ability to receive and process the novel antigen. (예를 들면, 문헌[Koch et al., J. Immunol. 155: 93-100(1995)]를 참조한다.) 실시적 양태에서, 비성숙 수지상 세포는 이들의 유지 및 배양에 적합한 배지(예를 들면, AIM-V, RPMI 1640, DMEM, X-VIVO 15 등) 내에서 배양시킬 수 있다. (For example, in: See [Koch et al, J. Immunol 155.. 93-100 (1995)]) In an ever embodiment the non-mature dendritic cells culture medium (for example, suitable for their maintenance and culture instance, in AIM-V, RPMI 1640, DMEM, X-VIVO 15, and so on) can be cultured. 배양 배지를 아미노산, 비타민, 항생제, 이가양이온 등으로 보충할 수 있다. The culture medium amino acids, vitamins, antibiotics, divalent cations such as may be supplemented with. 추가로, 사이토카인, 성장 인자 및/또는 호르몬을 성장 배지에 포함시킬 수 있다. In addition, it can include cytokines, growth factors and / or hormones in the growth medium. 예를 들면, 비성숙 수지상 세포의 유지 및/또는 증폭을 위해, 과립백혈구/대식세포 콜로니 자극 인자(GM-CSF) 및/또는 인터루킨 4(IL-4)와 같은 사이토카인을 통상 약 500단위/㎖의 농도로 첨가할 수 있다. For example, non-mature for maintaining and / or amplification of dendritic cells, granular leukocytes / macrophage colony-stimulating factor (GM-CSF) and / or interleukin-4 (IL-4) normal to a cytokine, such as from about 500 units / It may be added to ㎖ concentration. 다른 비성숙 APC는 당해 분야의 숙련가에게 공지된 방법에 따라 유사하게 배양 또는 증폭시킬 수 있다. Other non-mature APC can be similarly cultured or amplification according to methods known to those skilled in the art. 비성숙 APC의 제제를 성숙시켜 성숙한 APC를 형성할 수 있다. To mature the preparation of non-mature APC can be formed in the mature APC. APC의 성숙은 비성숙 APC의 유형에 따라, 항원(예를 들면, 예정된 항원)에 대한 노출 중 또는 노출 후에 발생할 수 있다. Maturation of APC are based on the type of non-mature APC, it can occur after exposure to the antigen or of the exposure to (e.g., a predetermined antigen). 특정 양태에서, 비성숙 수지상 세포의 제제를 성숙시킬 수 있다. In a particular embodiment, it may be a formulation of mature non-mature dendritic cells. 적합한 성숙 인자는 예를 들면, 사이토카인(예를 들면, TNF-α), 세균 생산물(예를 들면, BCG) 등을 포함한다. Suitable maturation factors include, for example, such as a cytokine (e.g., TNF-α), bacterial products (e.g., BCG). 본 발명의 특정 측면에서, 예정된 항원에 특이적인 APC를 제조하는 것이 바람직하다. In a particular aspect of the invention, it is preferred to prepare a specific APC to a predetermined antigen. 이러한 항원은 예를 들면, 세균 및 바이러스 항원, 종양 특이적 또는 종양 관련 항원(예를 들면, 종양 세포 용해물, 종양 세포 막 제제, 종양으로부터 분리된 항원, 융합 단백질 또는 리포좀) 또는 다른 항원일 수 있다. Such antigens are, for example, bacterial and viral antigens, tumor specific or tumor-associated antigen can be a (e. G., Tumor cell lysate, tumor cell membrane preparation, isolated antigens from tumors, fusion proteins, or liposomes) or other antigen have. 실시적 양태에서, 비성숙 수지상 세포를 암 면역치료 및/또는 종양 성장 억제를 위해 전립선 특이적 막 항원(PSMA)의 존재하에 배양시킨다. In an ever aspect, the non-cultured mature dendritic cells in the presence of a cancer immunotherapy, and / or specific for a prostate tumor growth inhibitory membrane antigen (PSMA). APC를 통상 예정된 항원과 접촉시키고 적합한 시간 동안 배양하여 항원을 수용 및 처리하게 한다. In contact with a predetermined antigen the normal APC and incubated for a suitable time to accommodate and process the antigen. 다른 측면에서, 분리된 APC 전구체를 비성숙 또는 성숙 APC의 제제를 제조하기 위해 사용한다. In another aspect, the separated APC precursors used for the production of non-mature or preparation of mature APC. APC 전구체를 당해 분야의 숙련가에게 공지된 바와 같이, 배양, 분화 및/또는 성숙시킬 수 있다. As the art the APC precursors known to those skilled in the art, can be cultured, differentiation and / or maturation. 특정 양태에서, 단핵성 수지상 세포 전구체를 아미노산, 비타민, 사이토카인(예를 들면, GM-CSF 및/또는 IL-4), 이가양이온 등을 첨가한 적합한 배양 배지(예를 들면, AIM-V, RPMI 1640, DMEM, X-VIVO 15 등)의 존재하에 배양시켜 단핵성 수지상 세포 전구체의 비성숙 수지상 세포로의 분화를 촉진시킬 수 있다. In certain embodiments, a short-nucleophilic dendritic cells, the amino acids, vitamins, cytokines precursor (e. G., GM-CSF and / or IL-4), lice, for a suitable culture medium (e.g., the addition of such cations, AIM-V, culture in the presence of RPMI 1640, DMEM, X-VIVO 15, and so on) to be able to promote differentiation of a single-nucleophilic dendritic cell precursors of non-dendritic cell maturation. 통상 사이토카인 배합물은 GM-CSF 및 IL-4 각각 약 500단위/㎖이다. Conventional formulation cytokine is GM-CSF and IL-4 from about 500 units / ㎖ respectively. 다음의 실시예는 단지 본 발명의 각종 측면의 예시로서 제공되었으며 어떠한 방법으로도 본 발명을 제한하지 않는 것으로 해석되어야 한다. The following examples were provided as illustrative only of various aspects of the present invention it should be interpreted not in any way limit the invention. 당해 실시예에서, 항원-독립적 공동자극 검정은 수지상 세포 제제의 성질을 측정하기 위해 사용된다. In this example, antigen-independent co-stimulation assay is used to measure the properties of the dendritic cell preparation. 수지상 세포 제제는 다음과 같이 26개의 상이한 사람 피검체로부터 제조되었다: 각각의 환자로부터의 백혈구 아페레시스 혈액으로부터 PBMC를 분리하고 5% 자가성 혈장을 첨가한 OptiMEM 배지(Gibco-BRL) 내에서 6일 동안 배양한 후, BCG, 수지상 세포 성숙화제의 존재하에 추가로 1일 배양하였다. Dendritic cell preparations were made from 26 different human subject as follows: in separating the PBMC from the white blood cells Oh Ferre cis blood from each patient and OptiMEM culture medium (Gibco-BRL) for 5% self-addition of St. plasma 6 after culture for one, BCG, incubated 1 day further in the presence of a dendritic cell maturation agent. 말초혈액 단핵 세포(PBMC)를 다음과 같이 제조하였다: 백혈구 아페레시스 혈액을 완충염으로 희석하고, FICOLL 용액으로 도포하고 2000rpm에서 20분 동안 회전시켰다. Peripheral blood mononuclear cells (PBMC) were prepared as follows: white blood cells Oh Ferre cis diluted blood into the buffer salt, and coated with a FICOLL solution and rotated at 2000rpm for 20 minutes. 경계면에서 백혈구를 분리하였다. White blood cells were separated at the interface. 자성 비드 선별을 사용하여 PBMC로부터 공동자극 기능을 제거하였다. Using a magnetic beads sorting to remove the co-stimulation function from PBMC. 요약하면, 제 II형 MCH 분자에 대한 항체를 자성 비드(Dynal New York)에 커플링시켰다. In summary, antibodies to type II MCH molecule was coupled to magnetic beads (Dynal New York). 자성 비드를 PBMC에 첨가하여 다음과 같이 제II형 MHC 분자를 갖는 세포를 제거하였다: 셀당 2 내지 10개의 비드를 PBMC에 첨가하고, 한 시간 동안 항온처리하였다. To remove the cells by the addition of magnetic beads on PBMC with an MHC type II molecule as follows: addition of 2 to 10 per cell, the PBMC and beads was incubated for one hour. 이러한 항온처리 후, 비드-결합 세포(APC)를 자성 장치를 사용하여 제거하였다. After this incubation, the bead-bond the cells (APC) were removed using a magnetic device. 수득된 PBMC의 집단은 주로 APC가 없었으며 T 세포를 50% 초과로 함유하였다. Group of the obtained PBMC were mostly had no APC contained T cells with more than 50%. 증식 검정은 다음과 같이 수행하였다: 1 ×10 4 개의 수지상 세포를 96-웰 배양 플레이트의 각각의 웰에 첨가하고 항-CD3 항체(BD Pharmingen, San Diego, California)와 접촉시켰다. Was brought into contact with 1 × 10 4 of the dendritic cells was added to each well of a 96-well culture plate, and wherein -CD3 antibody (BD Pharmingen, San Diego, California ): proliferation assay was then performed as follows. 이어서 1 ×10 5 개의 강화된 T 세포(상기 참조)를 첨가하고, 웰당 0.2㎖의 최종 농도가 되게 하였다. It was then added to 1 × 10 5 of enhanced T cells (see above), which was to be the final concentration per well of 0.2㎖. 당해 플레이트를 26시간 동안 항온처리하고, 이어서 3 H-티미딘으로 펄스시켰다. Incubating the art plates for 26 hours, followed by a pulse with 3 H- thymidine. 삽입된 표지를 수거 및 측정하기 전에 당해 플레이트를 추가로 18시간 동안 항온처리하였다. Additionally art plate before collection and measure the labeled insert was incubated for 18 hours. T 세포 증식(델타 cpm)은 항-CD3 항체의 존재하에 수지상 세포 제제의 샘플로 자극시킨 T 세포에 의한 3 H-티미딘 삽입과 수지상 세포 제제 단독의 샘플로 자극시킨 T 세포에 의한 3 H-티미딘 삽입의 차 사이의 상이함으로 측정하였다. T cell proliferation (delta cpm) is caused by T cells were stimulated with 3 H- thymidine inserted into the dendritic cell sample of the formulation itself by T was stimulated with a sample of dendritic cells in the presence of an agent, wherein the antibody -CD3 cell 3 H- Being different from the difference between the thymidine inserted was measured. 각각의 수지상 세포 제제에 대한 평균 델타 cpm은 3개의 샘플의 평균으로서 계산하였다. Mean delta cpm for each of the dendritic cell preparation was calculated as the average of three samples. 당해 검정의 결과는 다음의 표 1에 나타낸다. The result of that test is set forth in Table 1 below. 단독의 항-CD3 항체와 배양시킨 T 세포는 약 370의 평균 cpm을 나타내었다. Wherein the sole -CD3 antibody and was T cell culture and showed the average cpm of about 370. 이러한 낮은 수준의 3 H-티미딘 삽입은 항-CD3 항체가 준최적 농도에서 첨가되었음을 입증한다. 3 H- thymidine insertion of such a low level has demonstrated that the addition at the optimal concentration gave an anti -CD3 antibody. 단독의 수지상 세포 제제의 샘플과 공동 배양시킨 T 세포는 약 2281cpm의 평균 cpm을 나타내었다. They were co-cultured with dendritic cells for a single sample preparation T cells and showed the average cpm of about 2281cpm. 대조적으로, 항-CD3 항체 및 수지상 세포와 공동배양시킨 T 세포에 대한 평균 델타 cpm은 14,972cpm의 표준 편차를 갖는, 39,747cpm이었다. In contrast, the mean delta cpm for T was co-cultured with anti -CD3 antibody and dendritic cells, this was 39,747cpm with a standard deviation of 14,972cpm. 델타 cpm 값의 분포는 표준적이지만, 델타 cpm 값의 범위의 높은 말단에 대해서는 현저한 비대칭을 가졌다. Distribution of the delta cpm values ​​have standards, but had a significant asymmetry for the high end of the range of the delta cpm values. 당해 공동자극 검정은 특정 유형의 APC의 항원-독립적 T 세포 증폭을 자극하는 능력을 기준으로 한다. The art of co-stimulation assay is a specific type of APC antigen-based on the ability to stimulate a T cell-independent amplification. 다음의 연구는 당해 검정의 특이성을 입증하기 위하여 수행되었다. The following study was performed to demonstrate the specificity of that test. 수지상 세포 제제에서 가장 흔하게 발견되는 비수지상 세포 유형을 제조하고 공동자극 검정에 단독으로 사용하고 특성화된(참조) 수지상 세포 제제내에 가하였다. Manufactured non-aqueous surface cell types most commonly found on dendritic cells and agents used alone, the co-stimulation test and characterize (see) was added into the dendritic cell preparation. T 세포, B 세포 및 단핵구를 항체를 사용한 음성-선별을 사용한 자성 비드 분리에 의해 말초 혈액 단핵 세포(PBMC)로부터 정제하였다. With a T cell, B cell and monocyte antibodies voice were purified from peripheral blood mononuclear cells (PBMC) by magnetic bead separation using the screening. T 세포를 위해, HLA-DR, CD19 및 CD56에 대한 항체를 사용하였고, B 세포를 위해서는, CD2, CD3 및 CD14에 대한 항체를 사용하였다. For T cells, was used as an antibody for the HLA-DR, CD19 and CD56, to the B cells, it was used as the antibodies to CD2, CD3 and CD14. 단핵구를 위해서는, CD3, CD19 및 CD56에 대한 항체를 사용하였다. To the mononuclear cells, it was used as the antibodies to CD3, CD19 and CD56. 당해 검정은 다음과 같이 수행하였다: 실시예 1에 기술한 바와 같은 증폭 검정에서 수지상 세포를 대신하여 T 세포, B 세포 및 단핵구를 사용하였다. Art test was performed as follows: were performed using one T cell, B cells and monocytes in place of dendritic cells from the amplified test as described in Example 1. 수지상 세포 대신 사용한 T 세포는 증식을 예방하기 위해 방사선 조사하였다. T cells instead of using dendritic cells were irradiated to prevent proliferation. 이어서, 상기한 바와 같이, 동종 지표 T 세포를 첨가하고 40분 후에 증식을 결정하였다. It was then added, allogeneic T cell surface as described above, and determines the growth after 40 minutes. 수지상 세포 대신 사용된 경우, T 및 B 림프구는 어떠한 시험 농도로도 공동자극 검정에서 T 세포를 자극할 수 없었다. When used in place of dendritic cells, T and B lymphocytes were not in any test concentration to stimulate T cells in the co-stimulation assay. 다음의 표 2에 나타낸 바와 같이, PBMC로부터 분리된 단핵구는 수지상 세포의 세포수를 약 2.5배 첨가한 경우, T 세포 증식( 3 H-티미딘 삽입)을 자극할 수 있었다. As shown in the following Table 2, the mononuclear cells isolated from PBMC is the addition of about 2.5 times the number of cells of dendritic cells, we were able to stimulate T cell proliferation (3 H- thymidine injection). 그러나, 당해 증식은 동일한 수의 수지상 세포를 사용하여 수득된 것보다 매우 낮았다. However, the art is very low proliferation than those obtained by using the dendritic cells of the same number. 수지상 세포 제제내의 CD14 양성, CD11c 양성 세포 및 CD14 음성, CD11c 양성 세포가 등가의 공동자극 활성을 가지는 것으로 나타났으며 둘 다 수지상 세포인 것으로 사료되었다. Was shown to have a positive CD14, CD11c-positive cells and CD14 negative, CD11c-positive cells is equivalent to co-stimulatory activity of dendritic cells in the preparation was considered to be both dendritic cells. *CD11c 양성, CD14 양성 세포 및 CD11c 양성, CD14 음성의 공동자극 활성을 CD14(Pharmingen)에 대한 표지된 항체를 사용하는 형광 활성화 세포 분류(FACS)에 의해 수지상 세포 제제로부터 분리하였다. * CD11c dendritic cells were isolated from the preparation by the positive, CD14-positive cells and CD11c positive, CD14 fluorescence-activated cell sorting (FACS) for the co-stimulatory activity of the speech using a labeled antibody to CD14 (Pharmingen). 이들 검정에서, 수지상 세포 제제로부터의 CD11c 양성, CD14 양성 세포 및 CD11c 양성, CD14 음성 세포가 등가의 공동자극 활성을 갖는 것으로 나타났다. In these assays, CD11c-positive dendritic cells from the preparation, CD14-positive cells and CD11c positive, CD14 negative cells showed that with equivalent co-stimulatory activity of. 따라서, 세포 유형 둘 다 총체적으로 수지상 세포로서 지칭되었다. Therefore, both cell types were referred to collectively as a dendritic cell. 본 발명에 따르는 검정에서 사멸 세포의 가능한 효과를 측정하였다. In the black according to the invention to measure the possible effects of dead cells. 요약하면, 수지상 세포를 1% 포름알데하이드로 30분 동안 처리하고 56℃에서 1시간 동안 가열하여 치사시켰다. In summary, the dendritic cells treated for 30 minutes in 1% formaldehyde, and mortality was heated for 1 hour at 56 ℃. 이들 사멸(치사된) 세포 현탁액을 공동자극 검정에 사용하였다. These apoptosis (the lethal), the cell suspension was used for the co-stimulation assay. 이들 사멸 세포를 정해진 비율로 살아 있는 수지상 세포와 혼합하였다. These apoptotic cells were mixed with the dendritic cells alive in certain proportions. 이들 검정은 하기한 바와 같은 다른 경우를 제외하고, 실시예 1에서 상기한 바와 같이 수행하였다. These assays were performed as described above in Example 1, except for the different cases as described below. 다음의 표 3 및 4에 나타낸 바와 같이, 가열-치사시킨 수지상 세포는 본 발명에 따르는 공동자극 검정에서 본질적으로 어떠한 활성도 보유하지 않았다. 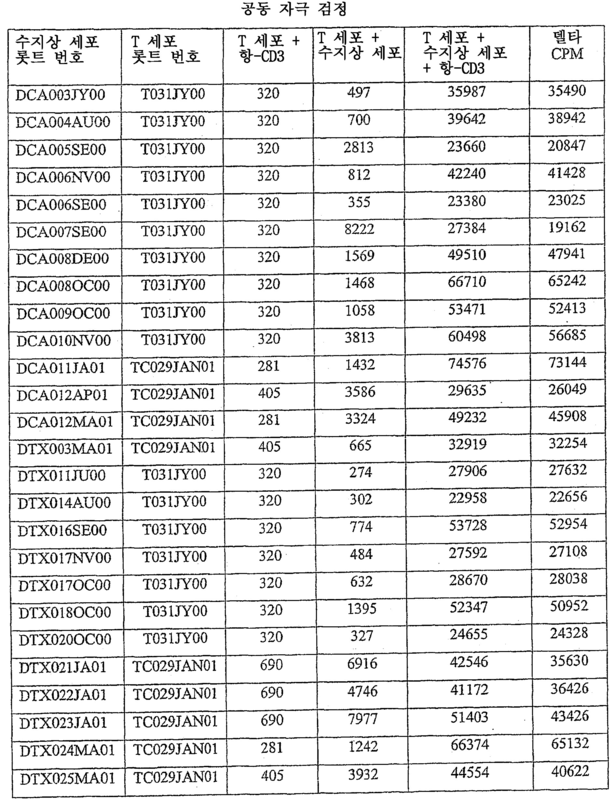 As shown in the following tables 3 and 4, the heat-lethal which dendritic cells were not inherently hold any activity in the co-stimulation test according to the invention. 포름알데하이드-처리된 수지상 세포는 프로피듐 요오다이드 염색에 의해 측정된 바와 같이, 약 20%의 생존 수지상 세포를 여전히 보유하였고; Formaldehyde-treated dendritic cells, propidium iodide, as measured by the beads dyed, were still holding a dendritic cell survival of about 20%; 이들 세포는 감소된 수준에서 공동자극 활성을 유지하였다. These cells were maintained co-stimulatory activity in a reduced level. 제3의 실험에서, 치사시킨 세포의 첨가는 당해 검정을 방해하지 않았다. In a third experiment, the addition of that cell lethality did not interfere with the black art. 증가된 수의 수지상 세포를 고정된 수의 지표 T 세포에 첨가하여 수지상 세포수 및 3 H-티미딘 검정사이의 관계를 측정하였다. Addition of an increased number of dendritic cells to T cell surface in a fixed number and to measure the relationship between the number of dendritic cells and 3 H- thymidine black. 0, 2000, 6000 또는 10,000개의 수지상 세포를 웰에 두었다. It placed 0, 2000, 6000 or 10,000 dendritic cells in the wells. 실시예 1에 기술된 바와 같은, 다음의 배양 환경을 사용하였다(예를 들면, 10 5 개의 T 세포를 갖는 웰당 항-CD3 항체 1ng). Example 1, which was used in the following culture conditions as described in (for example, 10 5 per well anti -CD3 antibody having a T-cell 1ng). 총 항온처리 시간은 40시간이었으며; Total incubation time was 40 hours; 항온처리 중 마지막 18시간은 3 H-티미딘의 존재하에 수행하였다. The last 18 hours of the incubation was carried out in the presence of 3 H- thymidine. 지표 T 세포의 3 H-티미딘 수용은 수지상 세포의 수가 증가함에 따라 실질적으로 선형으로 증가하였다. Indicator 3 H- thymidine acceptance of T cells was increased substantially linearly with increasing the number of dendritic cells. 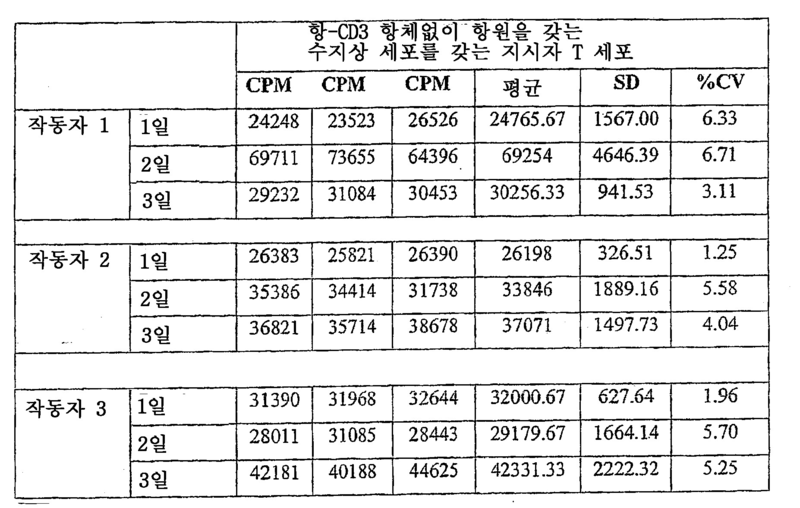 특히, 관측된 델타 cpm은 각각, 0, 약 7,000cpm, 약 15,000cpm 및 약 27,000cpm이었다. In particular, the observed delta cpm were, respectively, 0, approximately 7,000cpm, about 15,000cpm and about 27,000cpm. 식 y=2.7183-134.13(R 2 =0.9879)이 이러한 선형 관계에 근접하였다. Equation y = 2.7183-134.13 (R 2 = 0.9879 ) this was close to this linear relationship. 이들 결과는 공동자극 활성이 DC의 수에 선형적으로 의존할 수 있음을 증명하였다. These results demonstrated that the co-stimulatory activity can be linearly dependent on the number of DC. 실시예 1에 따른 공동자극 검정의 정밀도는 3명의 작동자가 동일한 양의 수지상 세포를 시험하게 함으로써 측정하였다. Precision co-stimulation test according to Example 1 was measured by the test for three operator dendritic cells of the same amount. 각각의 작동자는 자신의 롯트를 3회(3일 연속 중 1일 1회) 시험하였다. Each operator was tested three times (3 days once a day 1 of a row), its lot. 당해 데이타를 복제성(검정내 변수), 반복성(검정간 변수) 및 재현성(작동자간 변수)에 대해 분석하였다. The art data were analyzed for replication property (black in the variable), the repeatability (variable between black) and reproducibility (work tracking parameters). 미처리 데이타를 다음의 표 5에 나타낸다. It shows the raw data in the following Table 5. 변이 계수(CV)는 1.25 내지 16.18의 범위였으며, 높은 CV가 낮은 수준의 3 H-티미딘 삽입에서 관측되었다. Coefficient of variation (CV) was the range of 1.25 to 16.18, the highest CV, is observed at low levels of 3 H- thymidine insertion. 모든 조건을 3회 수행하였으며, 따라서 3개의 cpm 값을 복제성의 측정치로서 시험하였다. It was carried out three times to all conditions, and thus were tested in three replicate cpm values ​​as a measure resistance. 반복성 및 재현성은 델타 cpm을 사용하여 분석하였다. Repeatability and Reproducibility was analyzed using the delta cpm. 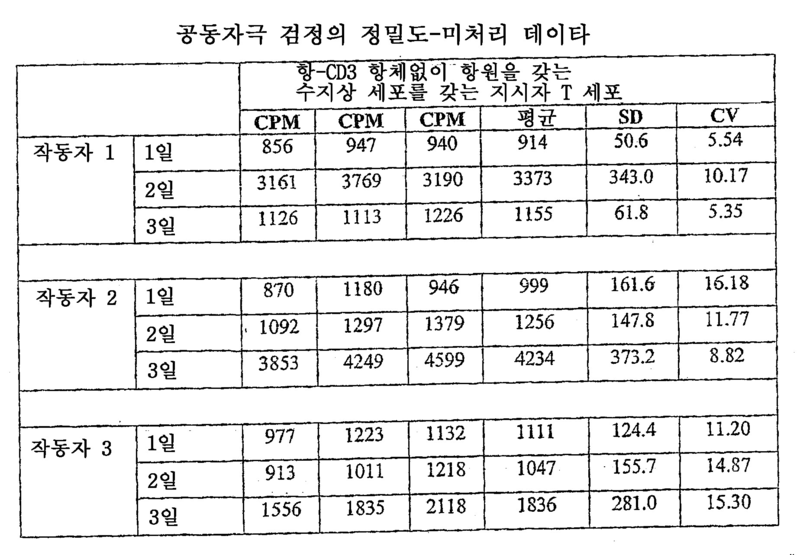 각각의 작동자에 대한 평균 델타 cpm, 표준편차 및 검정간 변이 계수(CV)가 다음의 표 6에 제시되어 있다. Mean delta cpm, coefficient of variation (CV) between a standard deviation and a test of each of the operators are shown in the following Table 6. 작동자 #1의 CV는 57.8%, 작동자 2는 14.4%, 작동자 3은 19.6%였다. Operator # 1 of the CV was 57.8%, the operator 2 is 14.4%, the operator 3 is 19.6%. 모든 3명의 작동자에 대한 평균 델타 cpm의 CV으로 재현성을 나타내며, 이는 14%이다. It represents the reproducibility CV of average delta cpm for all three operators, which is 14%. PSMA-적재된 수지상 세포를 다음과 같이 분석한다: 적재된 수지상 세포를 세제를 사용하여 용해시키고, 5 ×10 5 개의 세포의 용해물 당량을 7.5% SDS PAGE 겔의 각각의 줄에서 전기영동시킨다. PSMA- the loaded dendritic cells are analyzed as follows: thus the gel loaded dendritic cells are dissolved using a detergent, the electrical equivalent of the melt for the 5 × 10 5 cells from each line of a 7.5% SDS PAGE gel. 약 1시간 동안 150볼트에서 용해물 단백질을 분해시킨 후, 당해 단백질을 PVDF 또는 나일론 막으로 옮긴다. After decomposing the lysate proteins for one hour at about 150 volts, and transfer of the protein to PVDF or nylon membrane. PSMA-특이적 모노클로날 항체, 4D8(ATCC HB 12487; 미국 특허 제6,150,508호)를 사용하여 웨스턴 블롯팅을 수행한다. PSMA- specific monoclonal antibody, 4D8 (ATCC HB 12487; U.S. Patent No. 6,150,508) using perform Western blotting. 항체의 결합을 화학발광으로 가시화하고 필름에 노출시킨다. Visualize the binding of the antibody to the chemiluminescence and exposed to film. 겔상에 전개시킨 표준 PSMA 단백질의 동시-국소화에 의해 PSMA의 실체를 결정한다. The same time the standard was developed PSMA protein in the gel-determines the identity of PSMA by a localized. 상기한 실시예는 예시를 위해 제공되며, 청구된 발명의 영역을 제한하지 않는다. The above-described embodiments are provided for illustration and do not limit the scope of the claimed invention. 본 발명의 다른 변형은 당해 분야의 숙련가에게 용이하게 명백해질 것이며 첨부된 청구항에 포함될 것이다. Other variations of the present invention will become readily apparent to those skilled in the art will be included in the appended claims. 본원에 인용된 모든 출원, 특허, 특허 출원 및 기타 참조문헌은 참조로서 본원에 포함되어 있다. All documents cited in the present application, the patents, patent applications and other references are incorporated herein by reference. T 세포의 측정된 활성화와 T 세포에 대한 표준 활성화 역치 값 또는 값의 범위와 비교하여 APC의 공동자극 활성 및 성질을 측정하는 단계를 포함하여, APC의 항원-독립적, 공동자극 활성을 측정함으로써 APC의 성질을 평가하는 방법. Including the steps as compared with the range of the measured activation of T cells with a standard activation threshold value or values ​​for the T cells to determine the co-stimulatory activity and properties of the APC, the APC antigen-independent, by measuring the co-stimulatory activity APC methods of evaluating the properties. 제1항에 있어서, APC가 수지상 세포인 방법. The method of claim 1 wherein the APC is a dendritic cell. 제2항에 있어서, T 세포의 측정된 활성화와 T 세포에 대한 표준 활성화 역치 값 또는 값의 범위와의 비교가, 수지상 세포의 성질을 측정하기 위해 수지상 세포 단독의 샘플과 접촉시킨 T 세포의 측정된 활성화와 비교하는 것을 포함하는 방법. Claim 2, wherein in the measurement of T cells which T cells are compared in the range of the measured active and standard activation threshold value or values ​​for the T cells and, in contact with a sample of a single dendritic cells in order to measure the nature of the dendritic cells of the which comprises comparing and active. 제1 및 제2 활성화 값을 비교하여 수지상 세포 제제의 공동자극 활성을 측정하는 단계를 포함하는 방법. Claim by comparing the first and second activation values ​​comprises the step of measuring the co-stimulatory activity of the dendritic cell preparation. 제1항 또는 제4항에 있어서, APC에 의한 항원 제시를 측정하는 것을 추가로 포함하는 방법. 3. A method according to claim 1 or 4, further comprising measuring the antigen presentation by the APC. (2) (a) 공지된 기능 활성 및 실질적으로 공동자극 활성이 없는 T 세포를 제공하고, (b) 상기 T 세포를, 혼자서는 최대의 T 세포 활성화를 자극할 수 없는 농도의 CD3 결합제로 이루어지는 항원-유사제 및 수지상 세포 제제의 제1 샘플과 접촉시키며; (2) (a) provides no known function active and substantially co-stimulatory activity T cells, (b) said T cells, alone is made of the activation of up to T cell zero CD3 binding at a concentration which can not be stimulated antigen-like agents and sikimyeo contact with the first sample of the dendritic cell preparation; (c) 상기 접촉된 T 세포의 활성화를 측정하고; (C) measuring the activation of the contacted T cells; (d) 상기 접촉된 T 세포의 측정된 활성화와 T 세포에 대한 표준 활성화 역치 값 또는 값의 범위와 비교하여 수지상 세포 제제의 공동자극 활성을 측정함을 포함하여 수지상 세포 제제의 공동자극 활성을 측정하는 단계를 포함하는 방법. (D) measuring a co-stimulatory activity of the dendritic cell preparations, including that the measured co-stimulatory activity of the dendritic cell preparations as compared to the range of the standard activation threshold value or values ​​for the activation and T cell measurement of the contacted T cells It comprises. 제1항, 제4항 및 제6항 중 어느 한 항에 있어서, T 세포 및 APC 또는 수지상 세포가 동계인 방법. Of claim 1, claim 4 and claim 6 according to any one of claims, wherein the T cell and APC or dendritic cells is copper. 제1항, 제4항 및 제6항 중 어느 한 항에 있어서, T 세포 및 APC 또는 수지상 세포가 동종인 방법. Of claim 1, claim 4 and claim 6 according to any one of claims, wherein the T cell and APC or dendritic cells homogeneous. 제1항, 제4항 및 제6항 중 어느 한 항에 있어서, CD3 결합제가 항-CD3 항체, 또는 식물 렉틴 또는 유사분열제인 방법. Of claim 1, claim 4 and claim 6 according to any one of items, wherein -CD3 CD3 binding agent antibody, or a plant lectin or mitotic agent method. 제2항, 제4항 및 제6항 중 어느 한 항에 있어서, 수지상 세포가, 수지상 세포 성숙화제와 생체외 접촉되어 비성숙 수지상 세포로부터 유래된 성숙한 수지상 세포인 방법. Claim 2, claim 4 and claim 6 according to any one of claims, wherein the dendritic cells, mature dendritic cells are contacted with the biological agent outside of a mature dendritic cell derived from the non-mature dendritic cells. 제2항, 제4항 및 제6항 중 어느 한 항에 있어서, 수지상 세포가 비성숙 수지상 세포인 방법. According to claim 2, claim 4 and claim 6, any one of, wherein the dendritic cells are mature dendritic cells ratio. 제1항 또는 제4항에 있어서, T 세포에 이들의 세포 표면상에 제II형 MHC 분자, CD14, CD54, CD80, CD83 또는 CD86 분자를 발현시키는 말초 혈액 단핵 세포가 고갈된 방법. According to claim 1 or 4 wherein the peripheral blood mononuclear cells is a way of expressing the depletion-type second II thereof on the cell surface MHC molecules, CD14, CD54, CD80, CD83 or CD86 molecules on T cells. 제1항, 제4항 및 제6항 중 어느 한 항에 있어서, T 세포의 활성화를 3 H-티미딘 삽입 검정, T 세포 사이토카인 생산 검정, 또는 T 세포 활성화 마커의 발현 조절 검출로 측정하는 방법. Of claim 1, claim 4 and claim 6 according to any one of, wherein for measuring the activation of T cells with 3 H- thymidine inserted into black, black T cell cytokine production, or the expression control of a T cell activation marker is detected Way. 제13항에 있어서, 검정된 T 세포 사이토카인 생산이 IFNγ또는 인터루킨 2 생산, 세포외 사이토카인 생산, 또는 세포내 사이토카인 생산인 방법. The method of claim 13, wherein the black T-cell cytokine production IFNγ or IL-2 production, in which the extracellular cytokine production, or intracellular cytokine production. 제13항에 있어서, T 세포 활성화 마커가 CD25, CD69, CD44 또는 CD125인 방법. 14. The method of claim 13, wherein the T cell activation marker CD25, CD69, CD44 or CD125. 제13항에 있어서, T 세포 활성화 마커를 T 세포 활성화 마커에 결합할 수 있는 표지된 항체를 사용하여 검출하는 방법. 14. The method of claim 13, detected using a labeled antibody capable of binding to the T cell activation marker for T cell activation markers. 제1항에 있어서, 표준 활성화 역치 값 또는 값의 범위가 상이한 공동자극 활성과 관련되는 방법. 2. The method of claim 1, where the standard activation threshold value or range of values ​​associated with a different co-stimulatory activity. 제5항에 있어서, 항원의 제시를 웨스턴 블롯팅, 유동 세포계수법 또는 항원 특이적 T 세포의 활성화로 측정하는 방법. The method of claim 5, wherein the presentation of antigen Western blotting, a method of measuring the activation of the flow cytometry, or antigen-specific T cells.